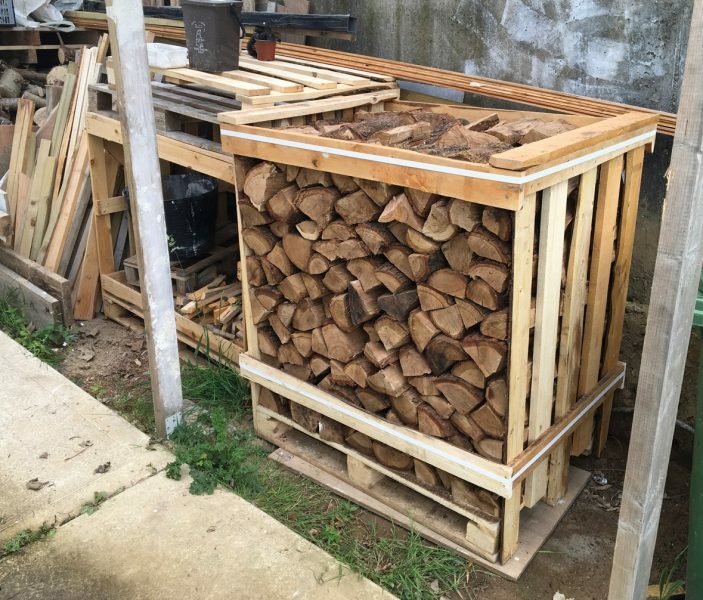 We just received a fresh delivery of kiln-dried wood from local supplier Woodplus so we are back in BBQ & Pizza business for the summer. 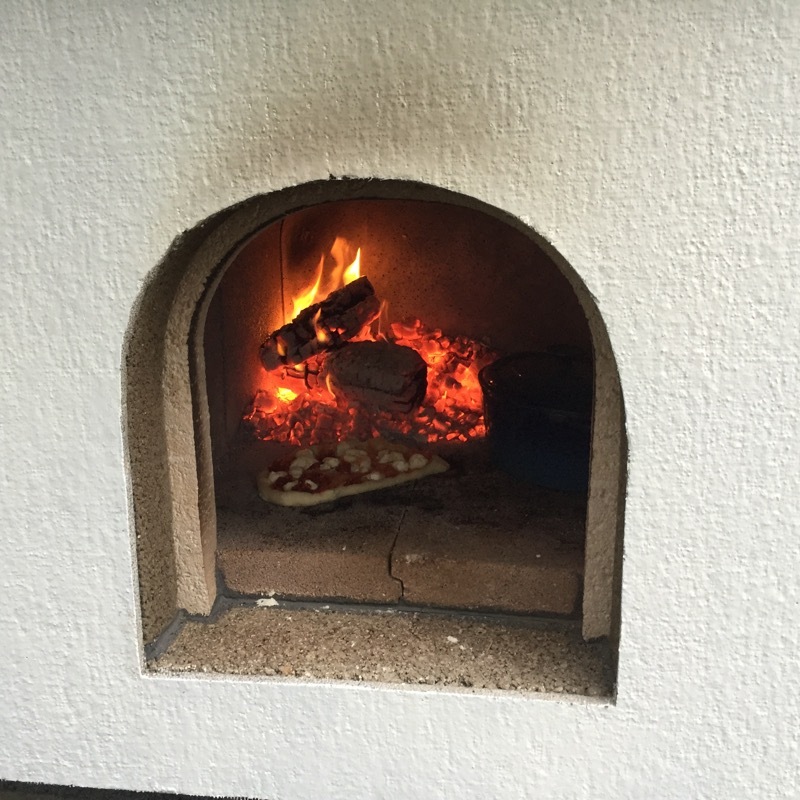 The pizza oven fairly eats wood to get it up to 300C+ and keep it there. 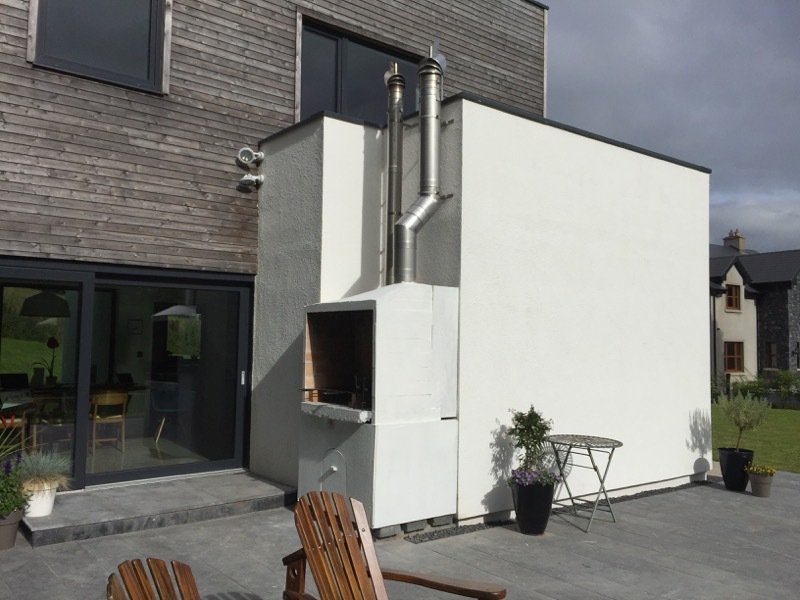 A fresh lick of paint on the wall for the summer and we are ready to cook. 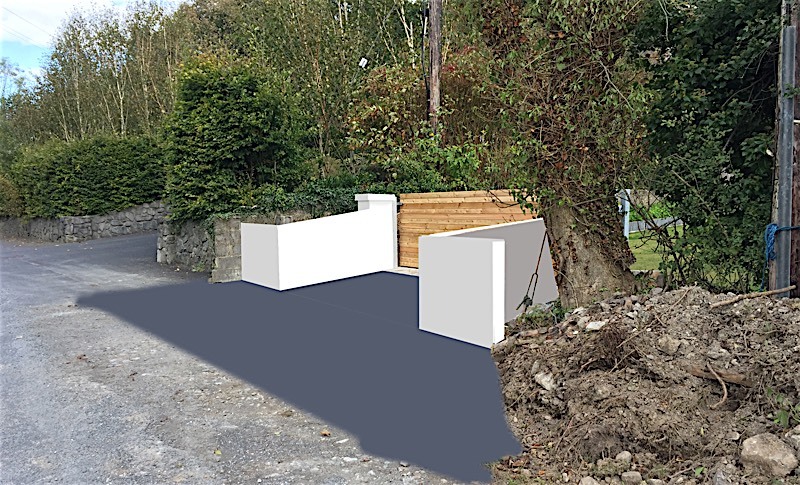 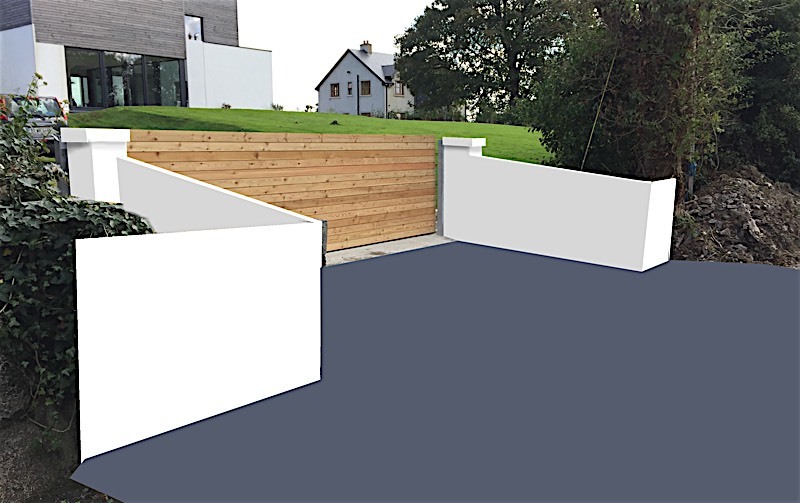 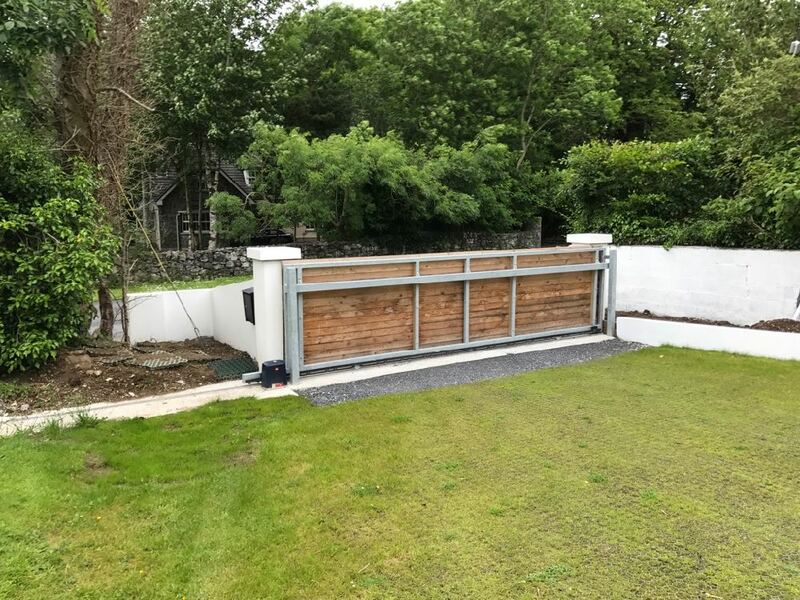 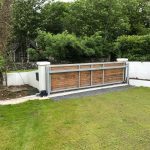 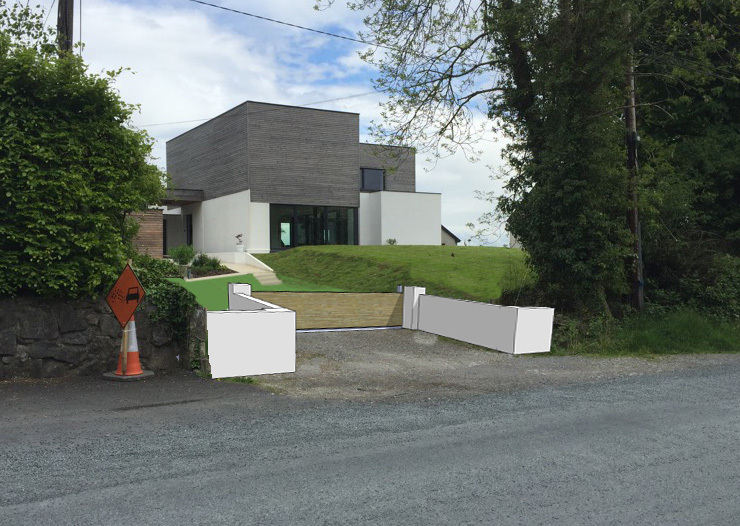 Initial design of the gate was mocked up to work out the size, opening, wall heights etc. 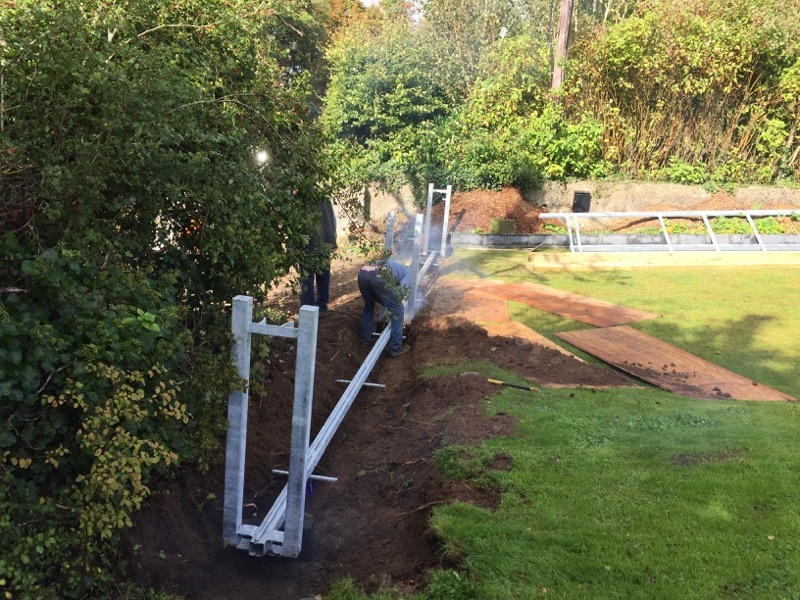 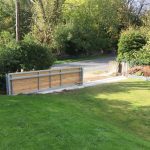 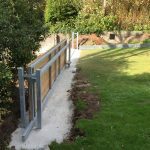 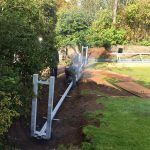 The construction process involved design and build of the rolling gate frame and track frame by a local metal working firm. 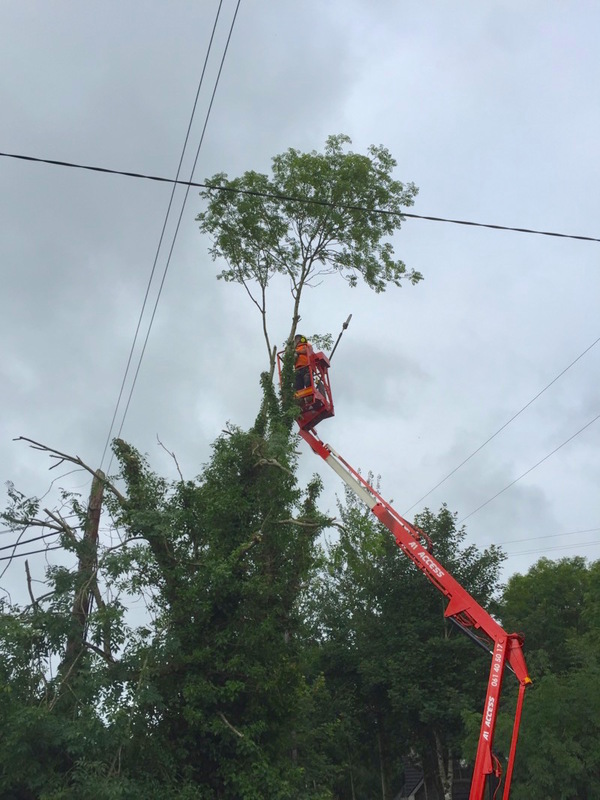 The motor, remote control and all comms were fitted by Active Technology a local company who were very good to deal with. 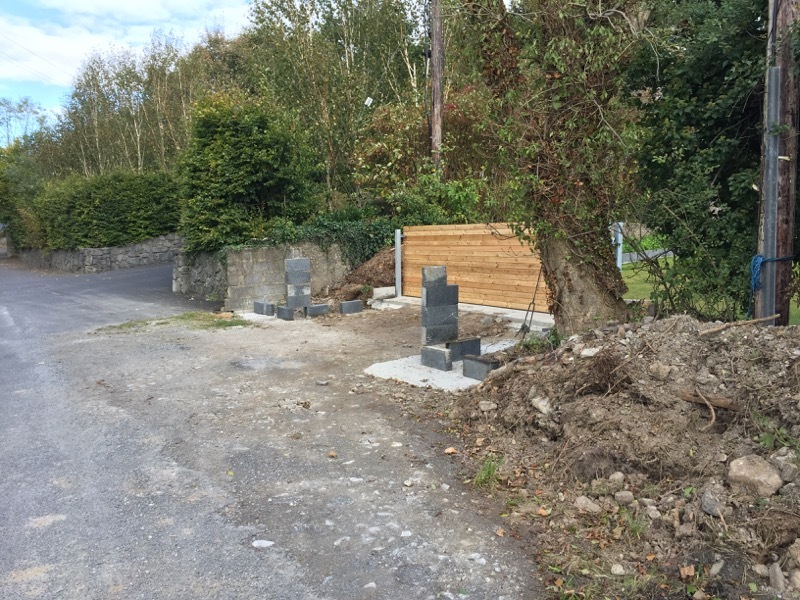 With the gate operational we had the boundary walls built by a skilled blocklayer who did some other work on the house for us. 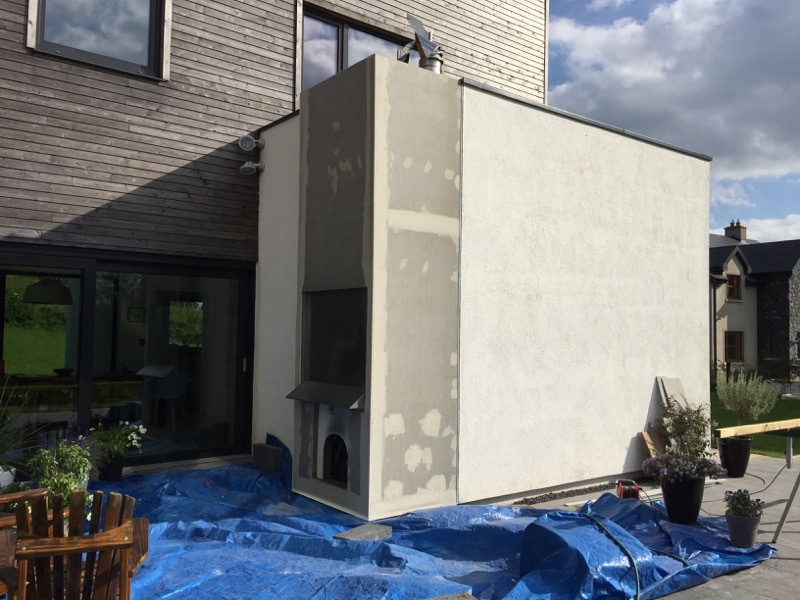 He finished the job in a couple of days but due to the arrival of winter weather we deferred the plastering until 2017. 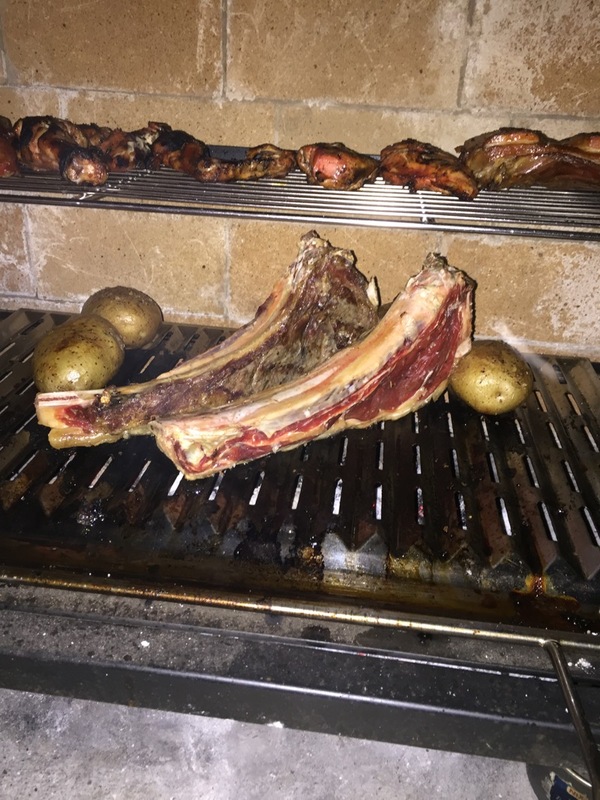 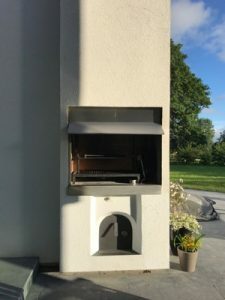 The second phase of the BBQ and Pizza Oven started in the Autumn. 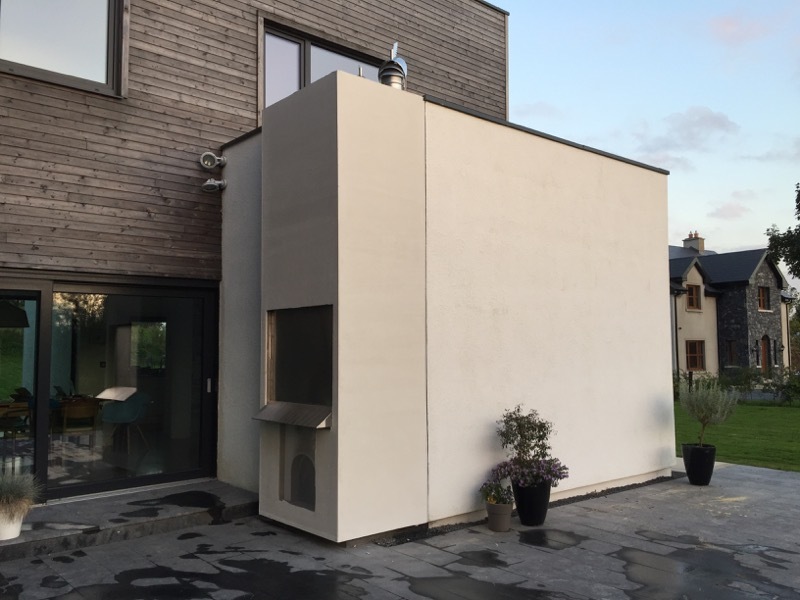 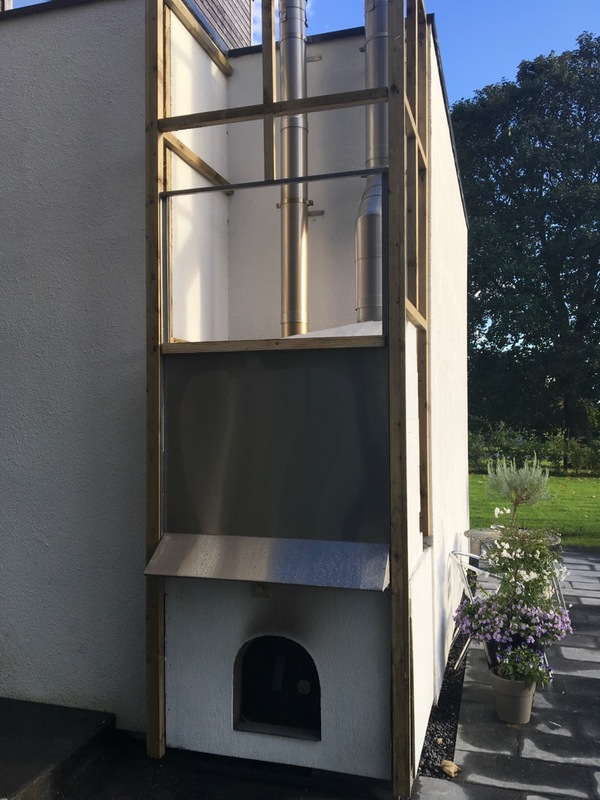 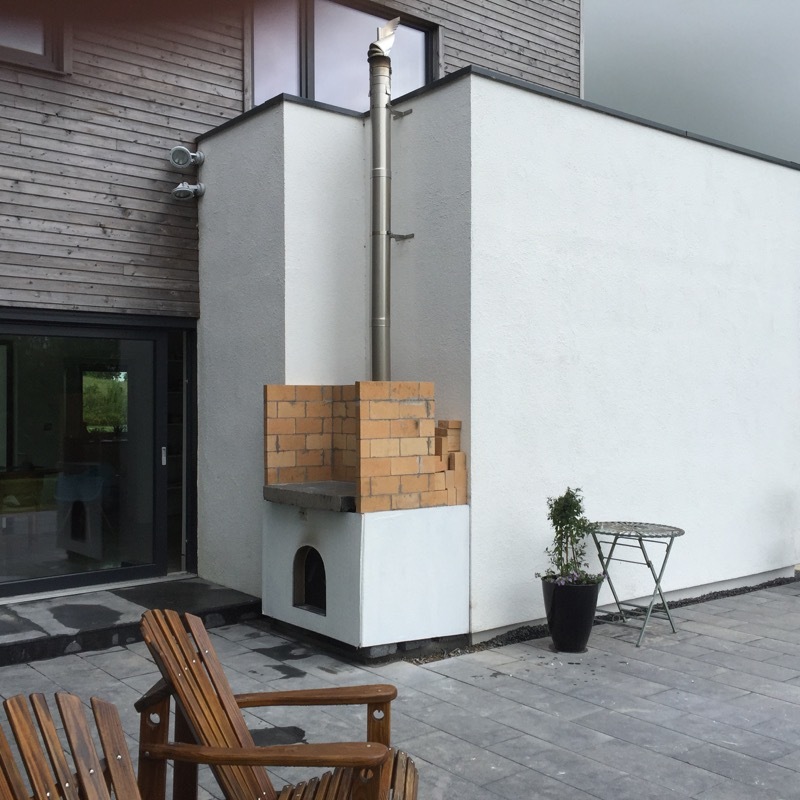 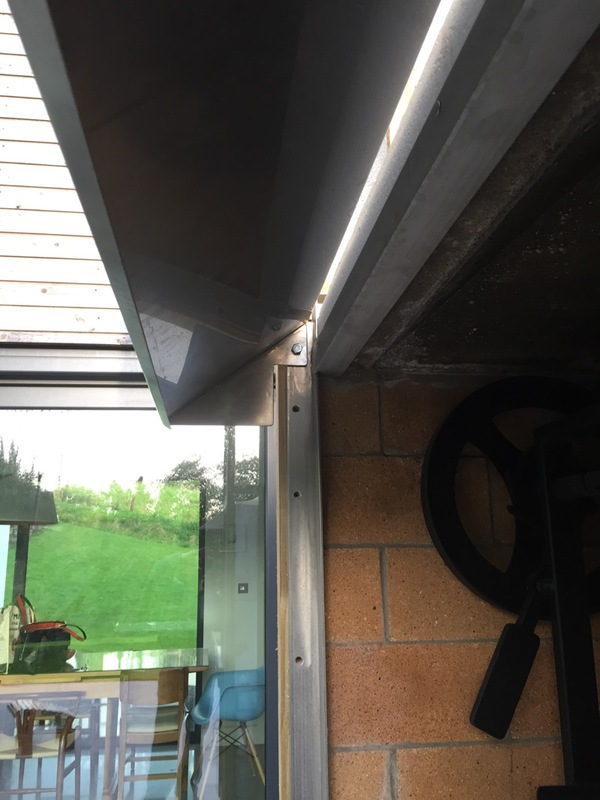 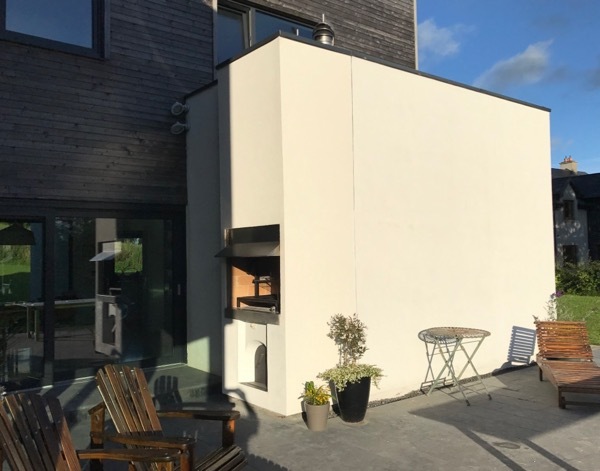 The timber frame was erected around the BBQ and fixed onto the existing aquapanel wall system. 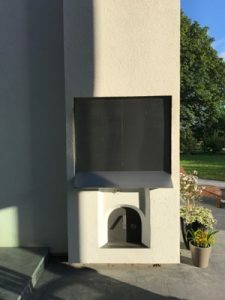 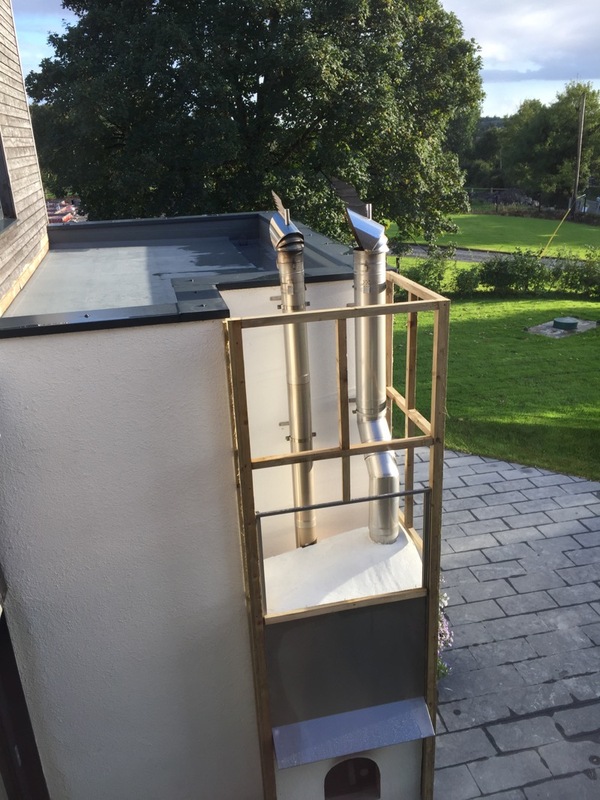 Once fixed the fabricated stainless steel cap was fitted at the top which fits around the 2 flues and includes an in-built drain fitting to allow water to drain to the base of the wall. 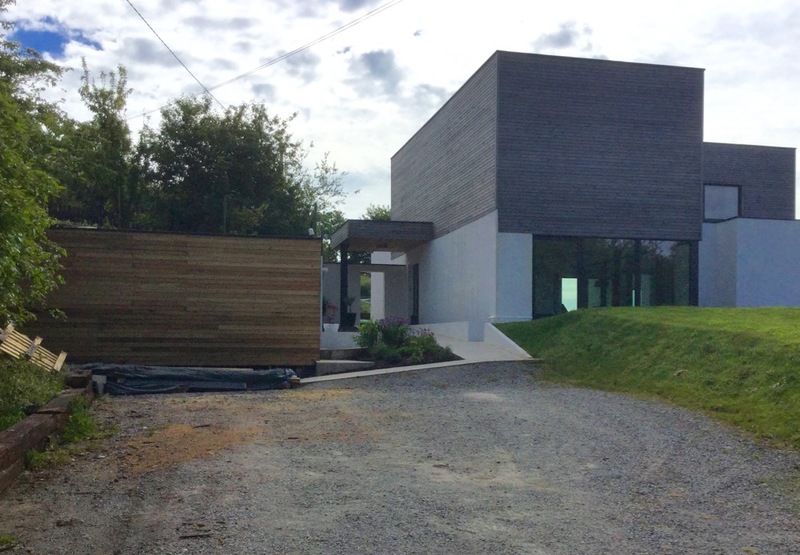 The progress on the cladding has been good with plenty of dry weather this autumn. 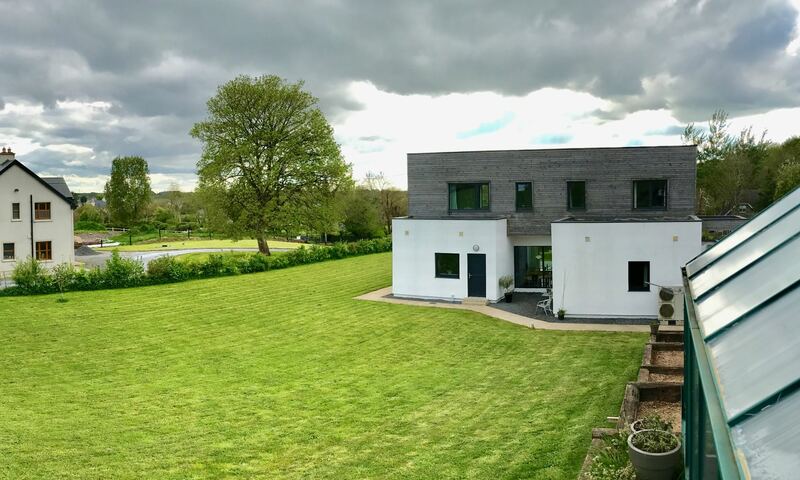 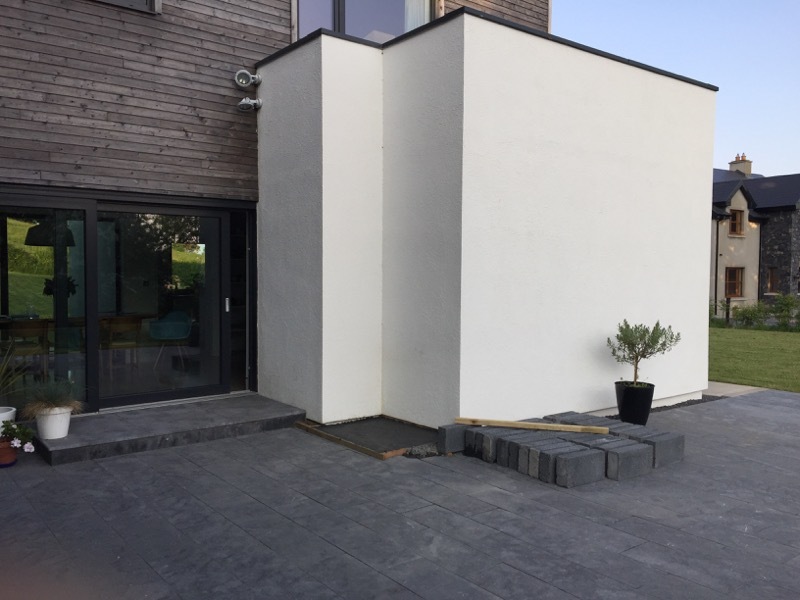 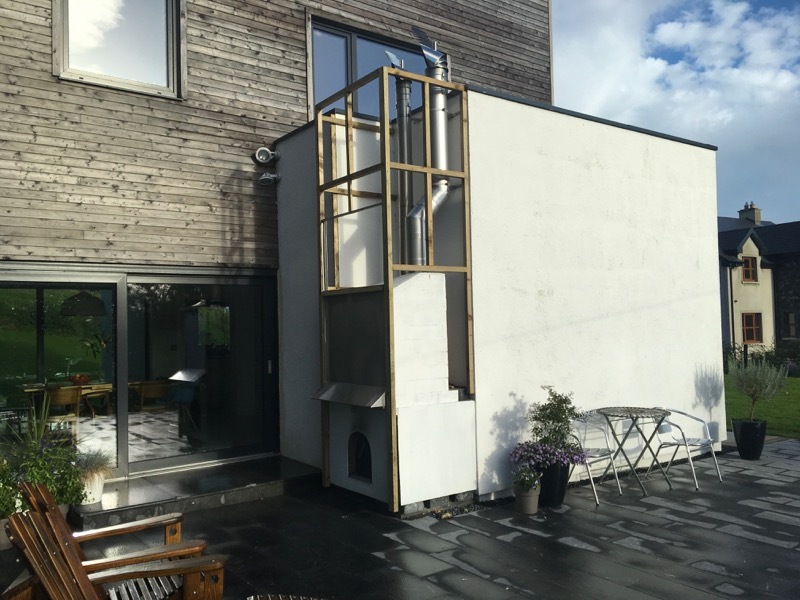 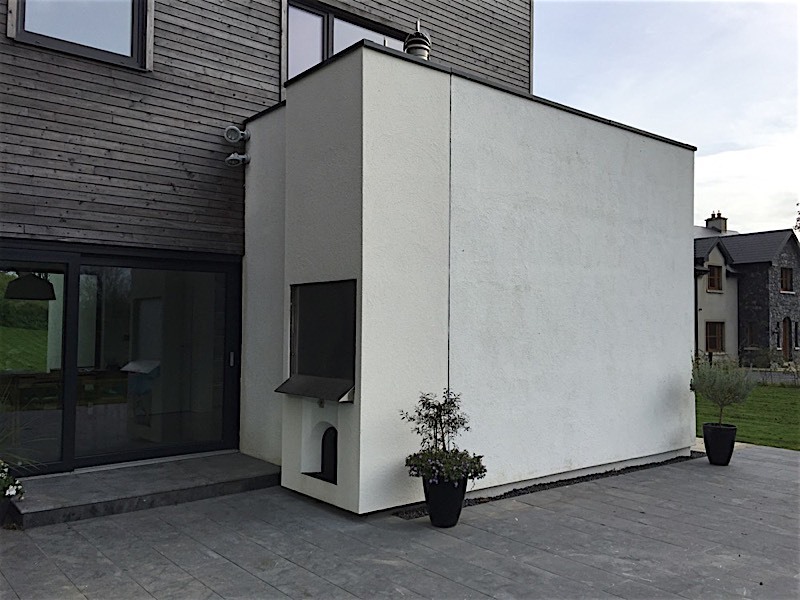 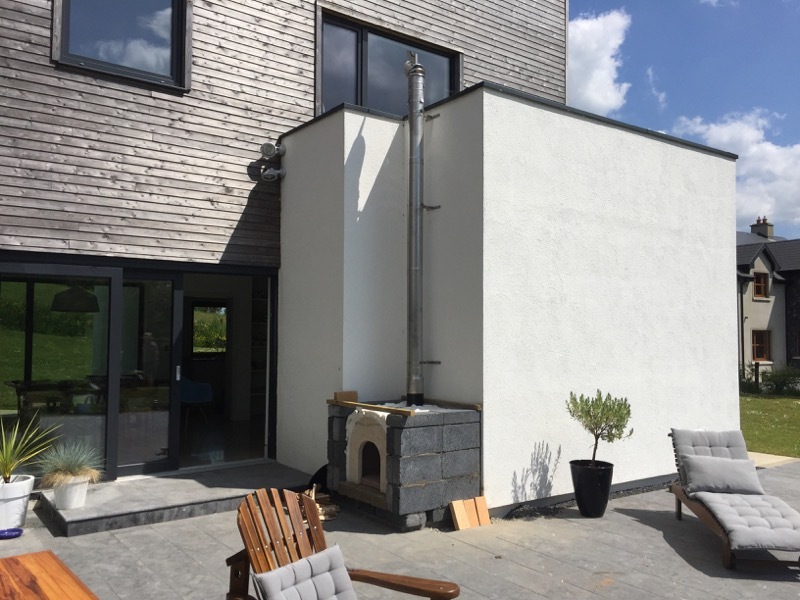 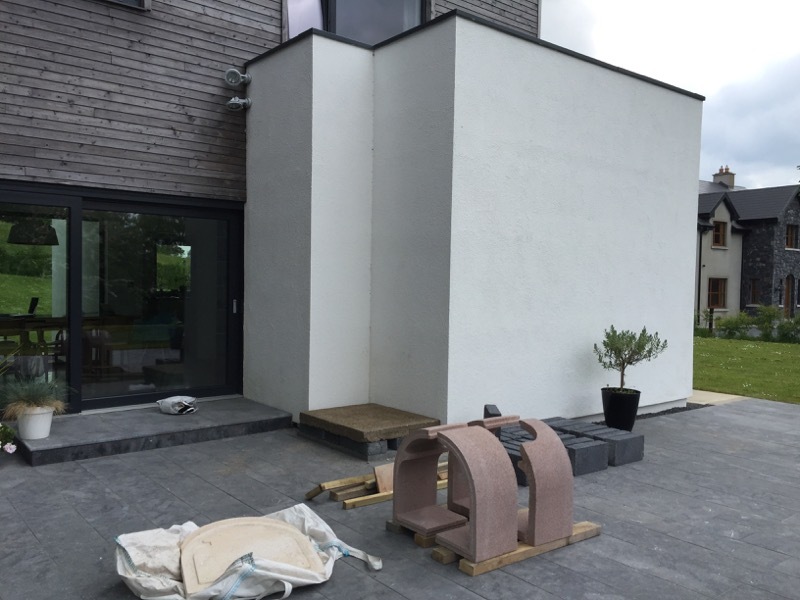 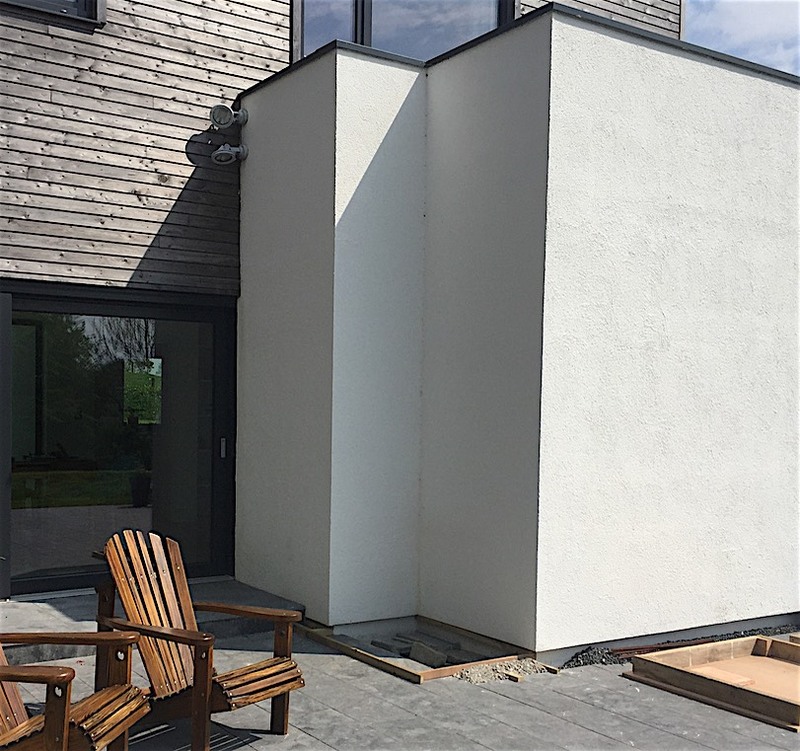 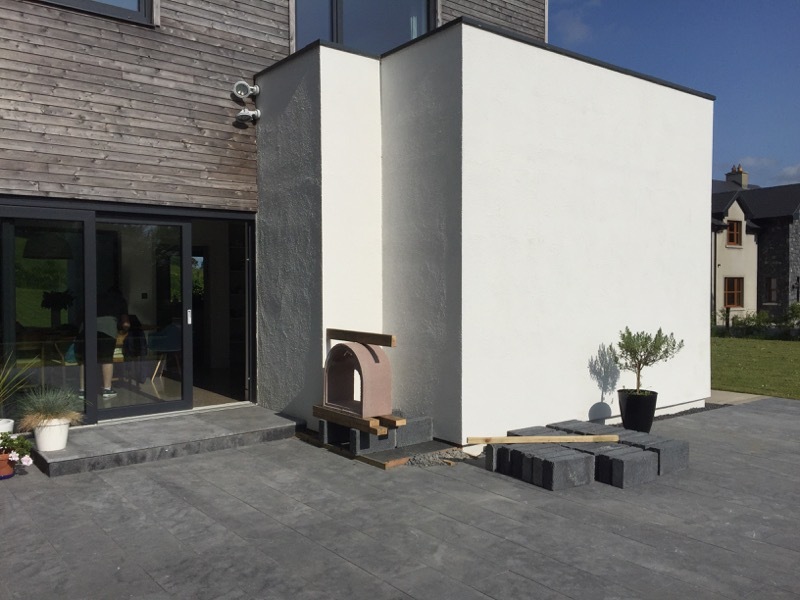 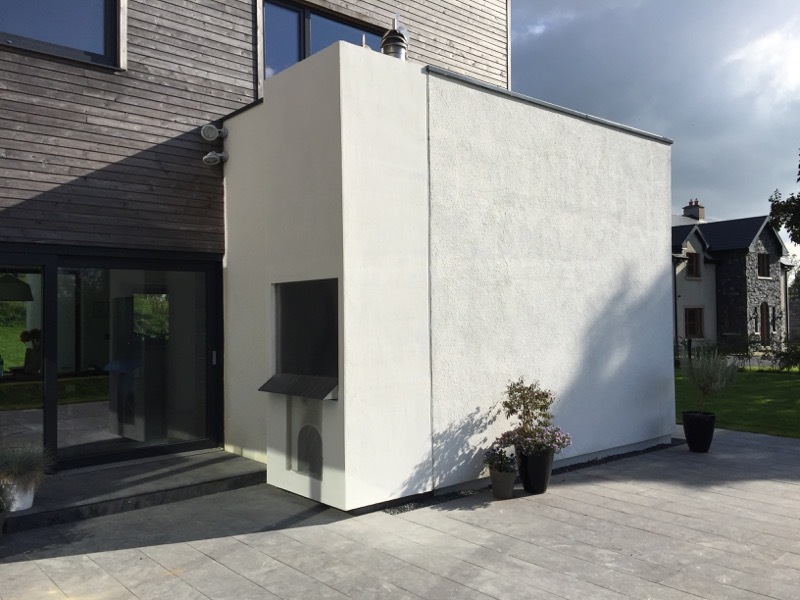 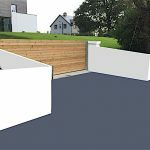 The treated timber frame supports 12mm concrete board with a 5 layer rendering system which comprises joint filler, basecoat (with embedded mesh), primer, topcoat acrylic render and finally a paint finish. 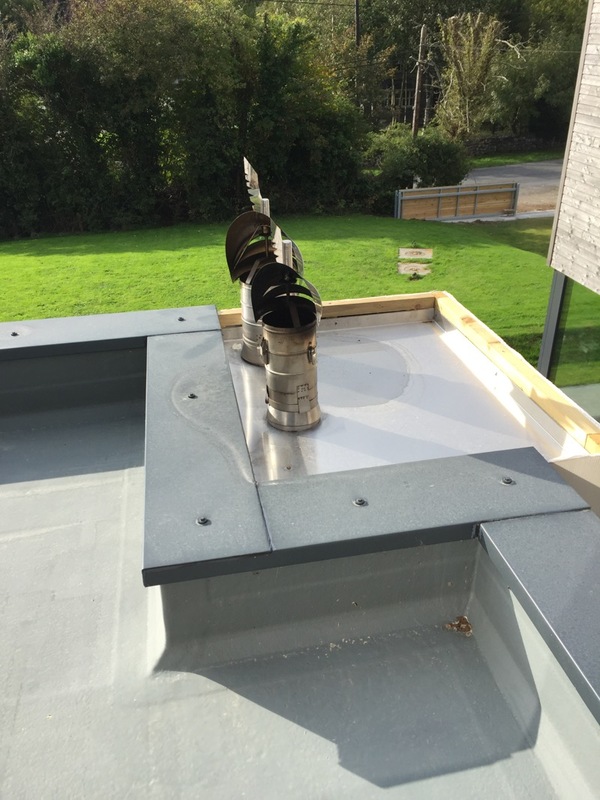 Aluminium capping fitted at the end to complete the integration with the existing house structure. 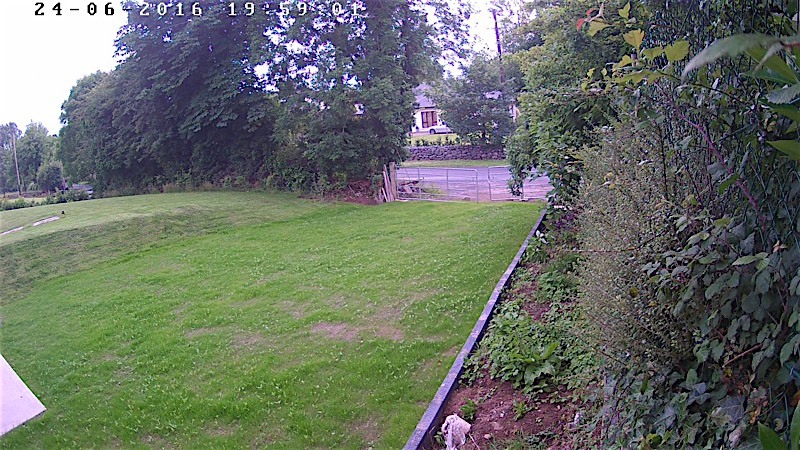 Our boundary hedge was too high and we were losing the evening sun on the patio so .. we had the tops of the two largest trees reduced and some tidying up on the rest of the wild hedgerow in front of the house. 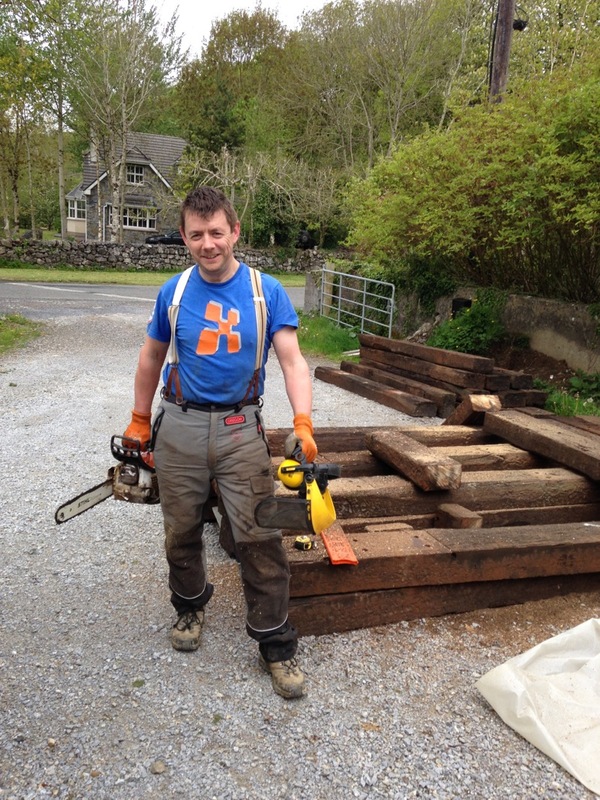 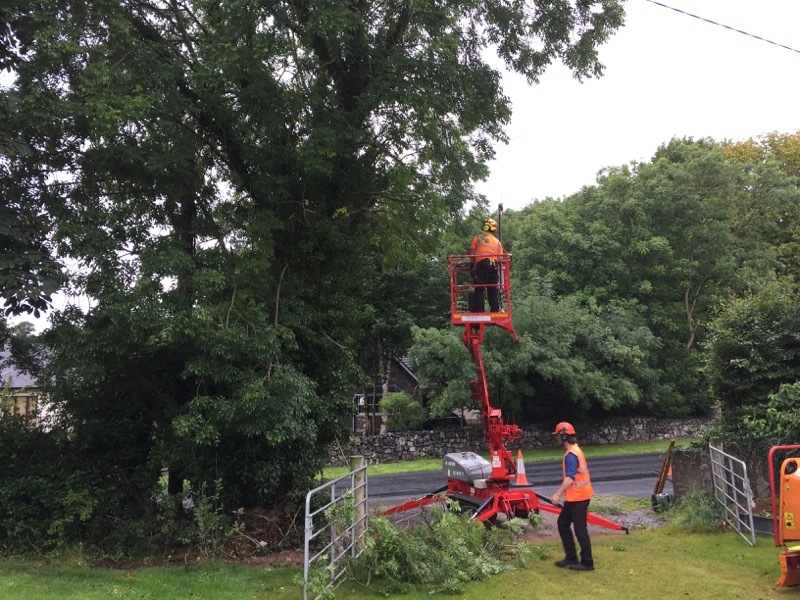 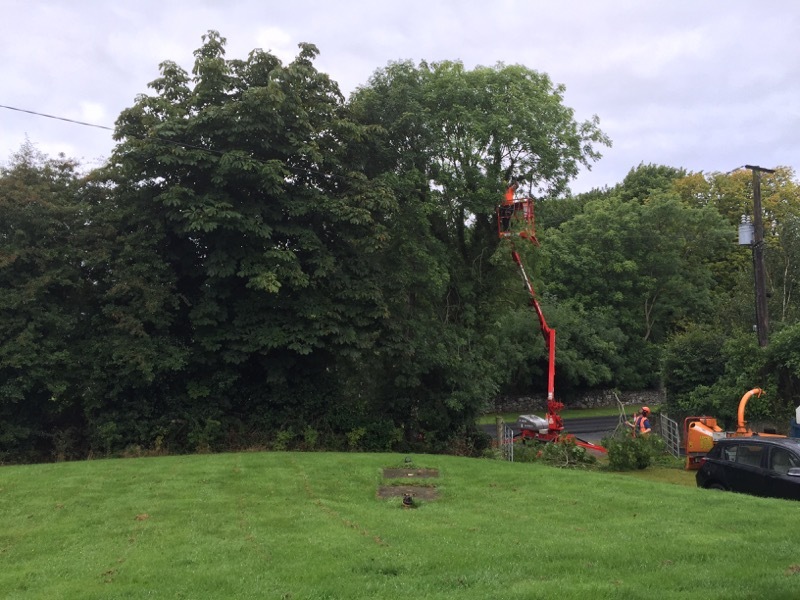 The tree surgeon services were provided by Munster Tree Surgeons who were efficient and professional. 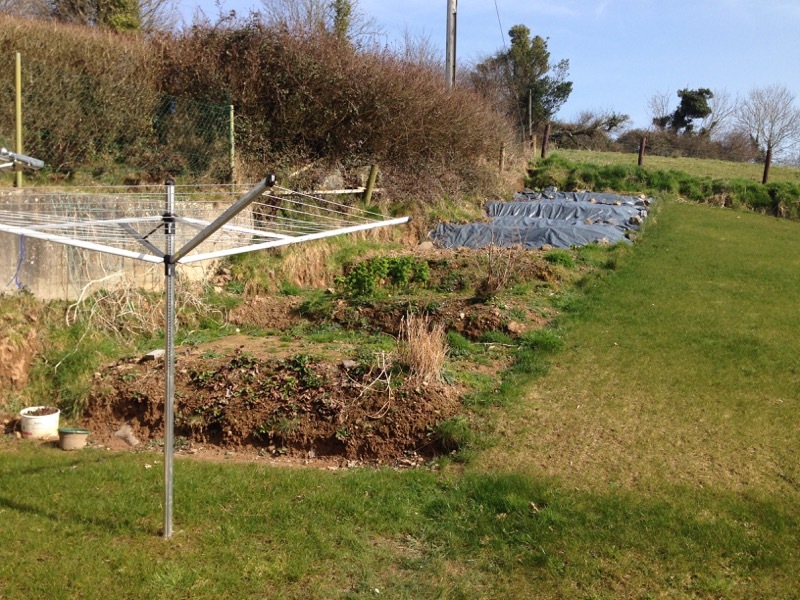 They left the garden almost as tidy as they found it and we have a large pile of ash and chestnut logs which will be good for our stove in 2017 & 2018. 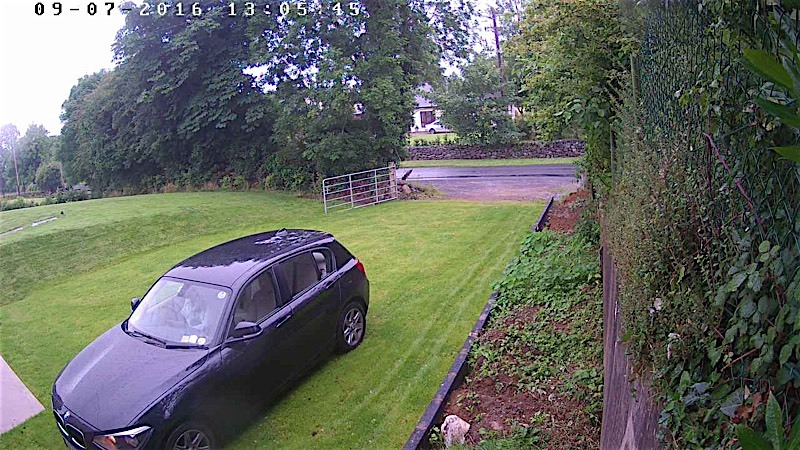 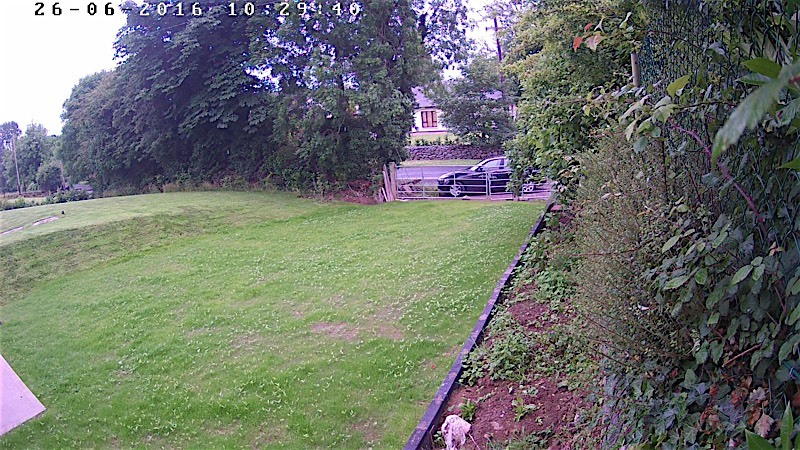 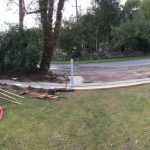 6 weeks after the driveway was laid the grass has taken root and we can park on it. 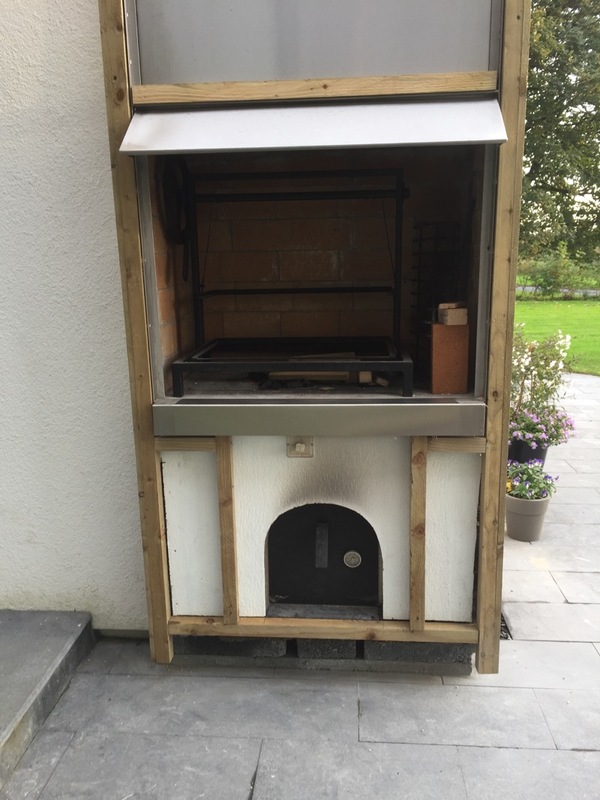 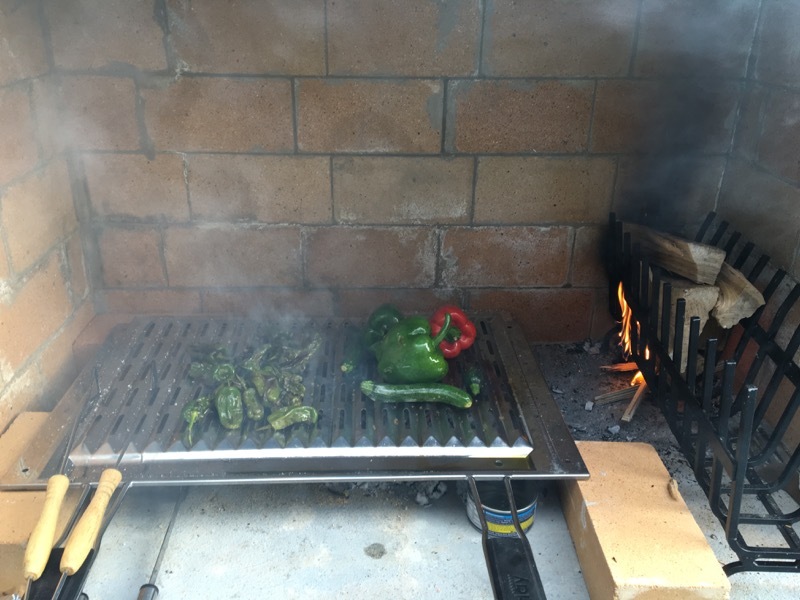 The second project for summer 2016 is a 2-in-1 Pizza Oven and BBQ. 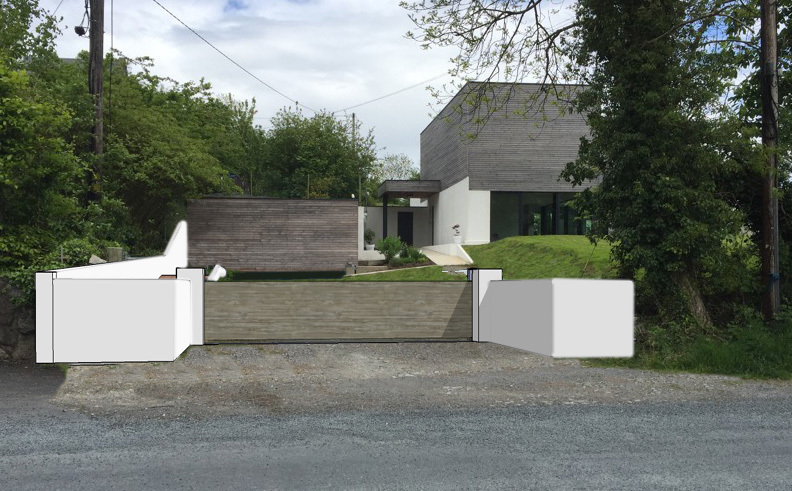 This has been in the planning stage since before the house was built and we intentionally left a space in the exterior wall to incorporate it. 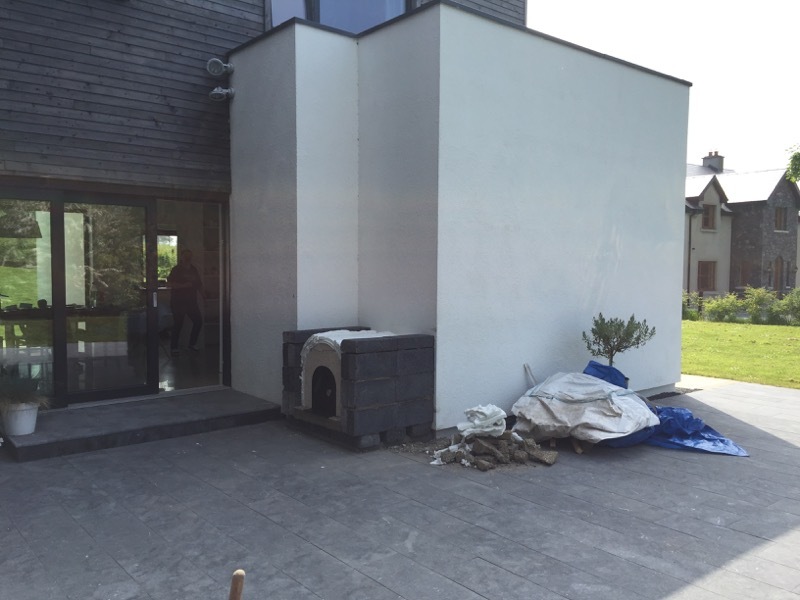 The initial phase was to remove the gravel and cast a concrete base to carry the weight of the Oven & BBQ. 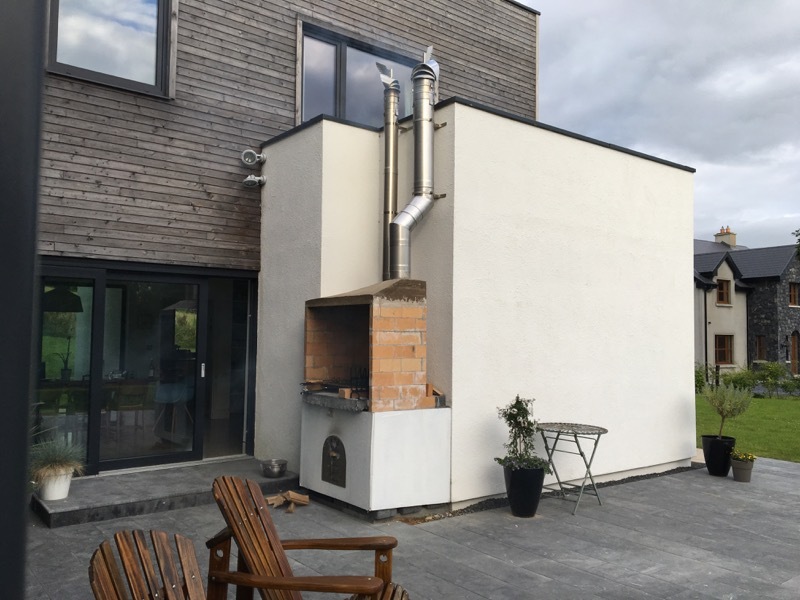 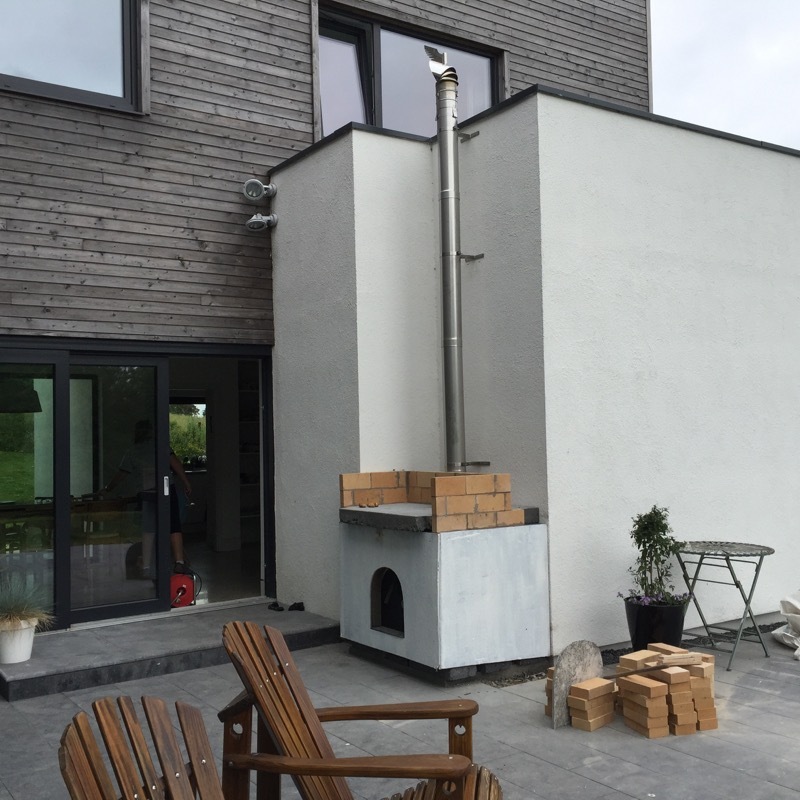 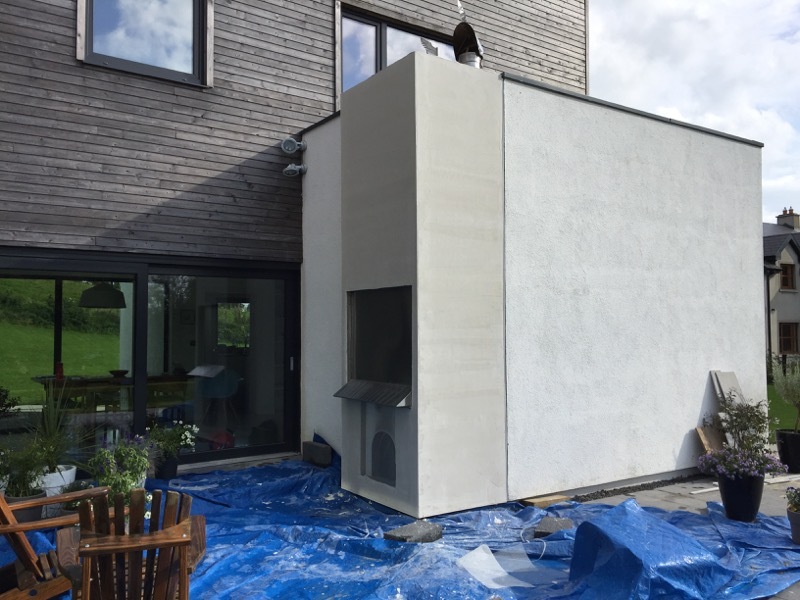 The gallery below shows the progress of the build with Pizza Oven installed below the BBQ. 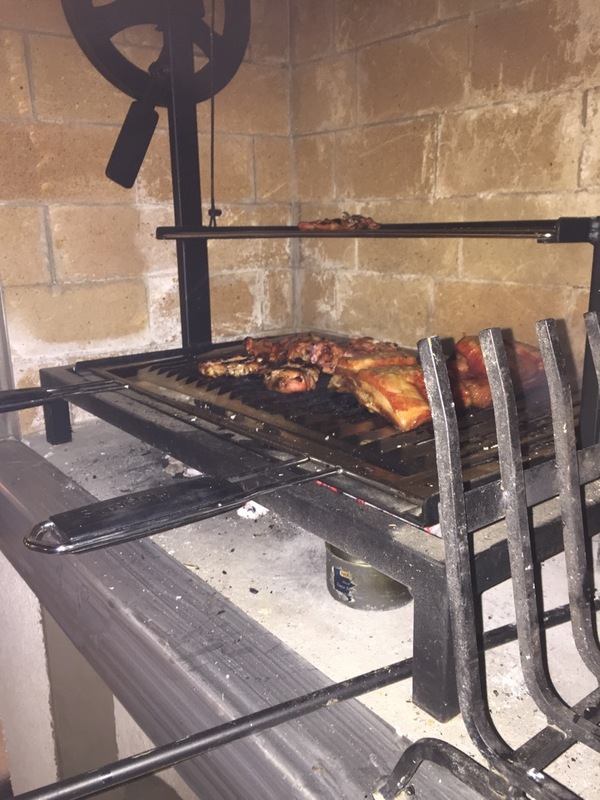 We’ve had a few pizzas and BBQs already and so far so good. 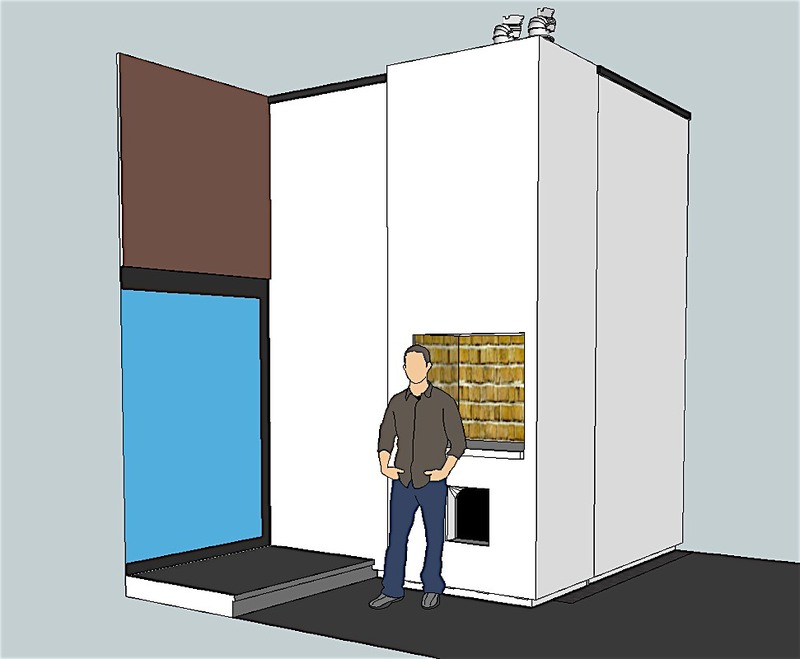 The plan is to put a metal frame around the whole thing and cover in the same panelling that the rest of the ground floor is covered with. 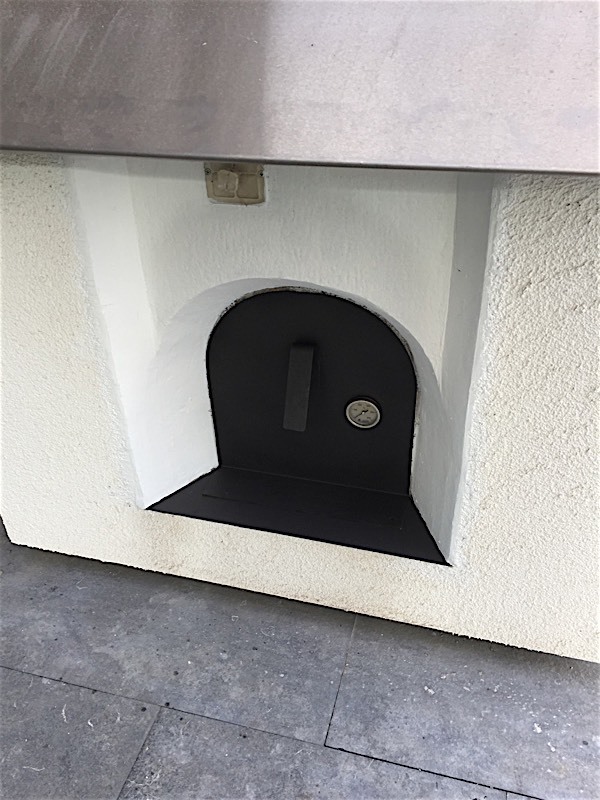 Sources for the various components indicated below. 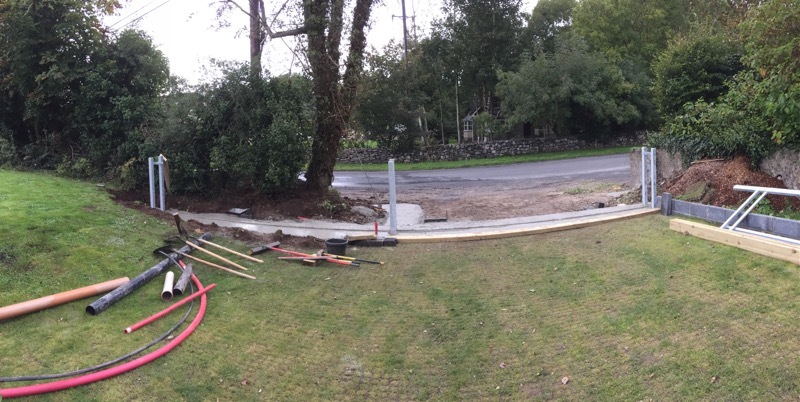 So we finally get the driveway started in 2016 .. we’ve opted to use a grass grid paving system so we can mow our driveway. 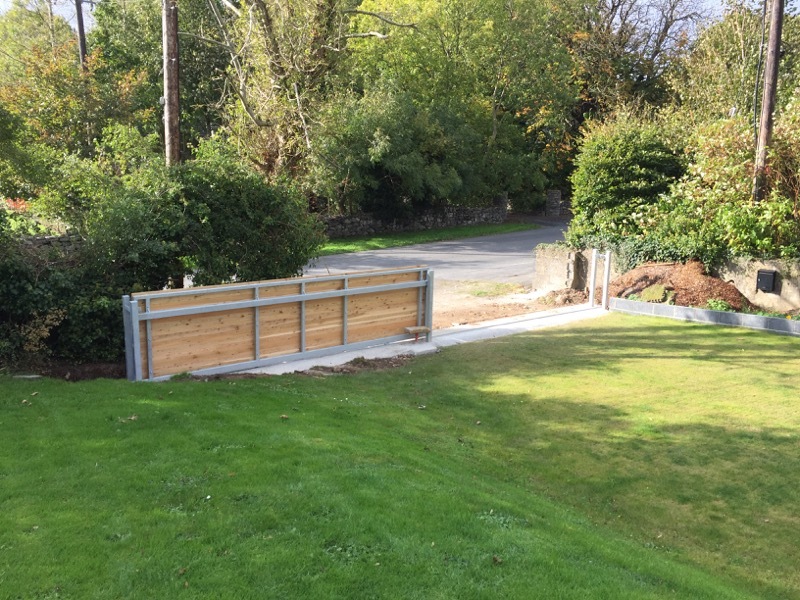 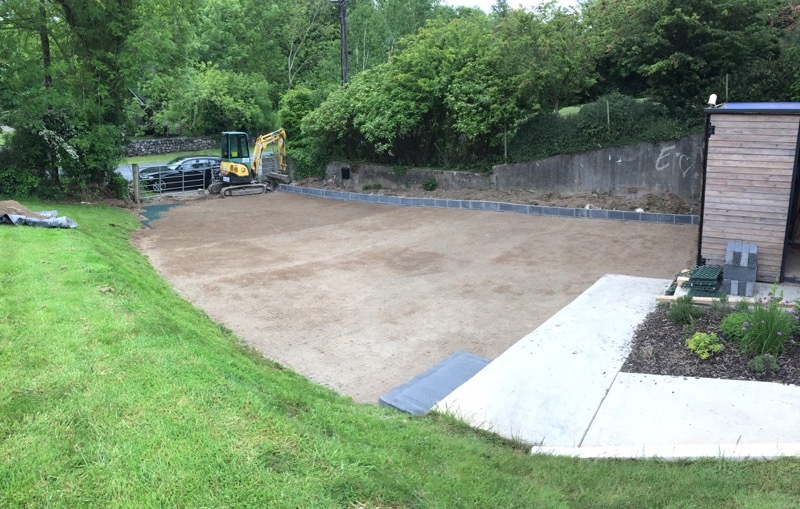 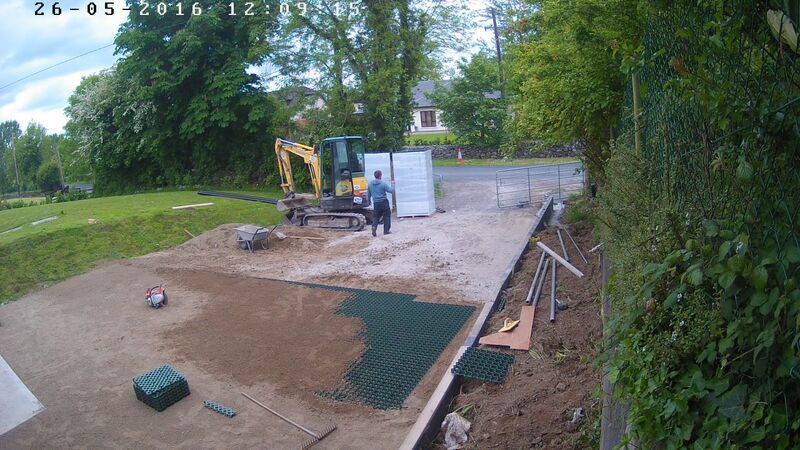 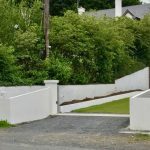 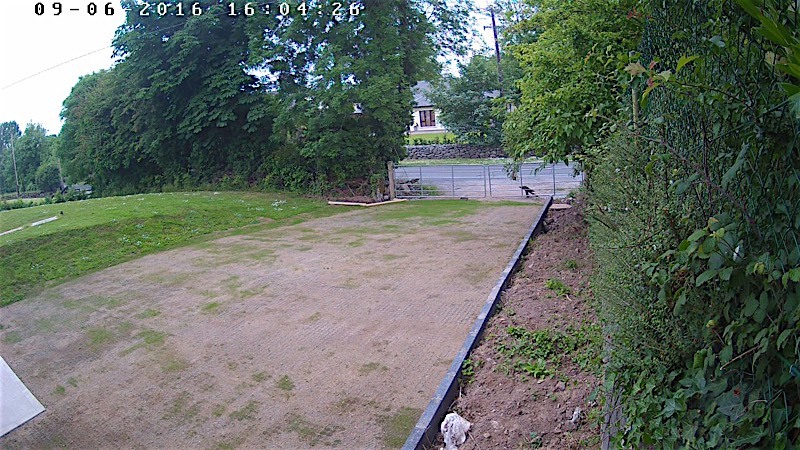 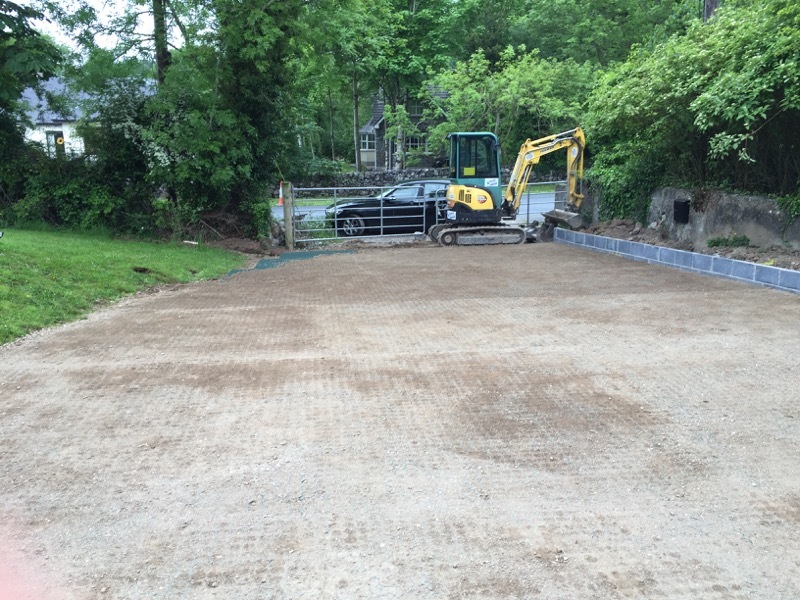 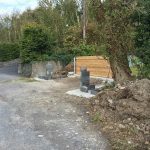 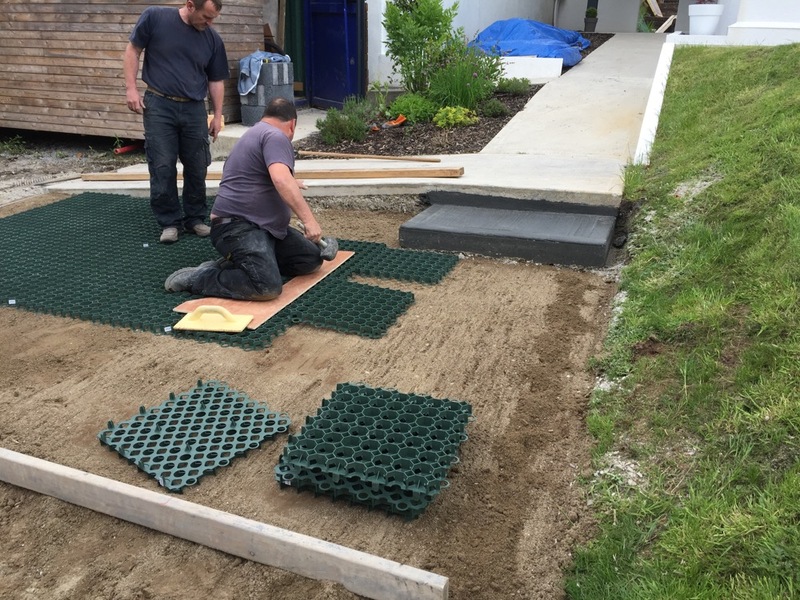 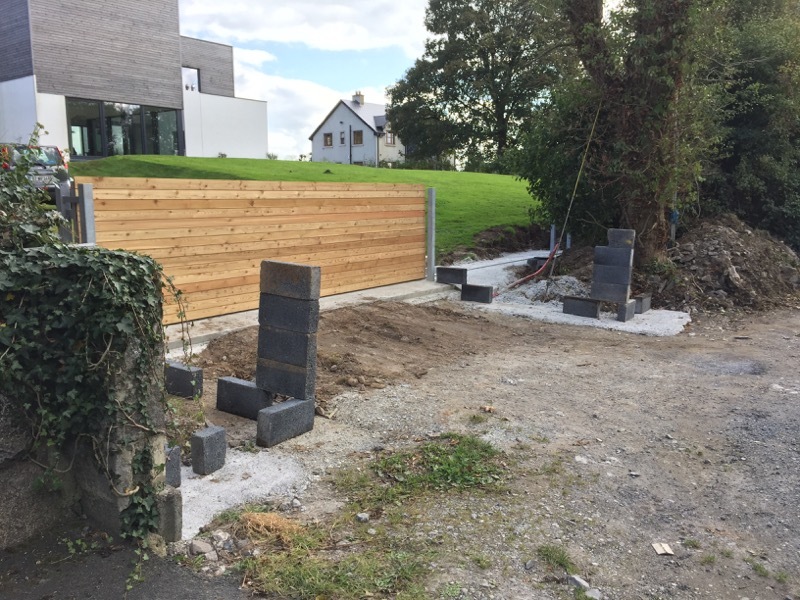 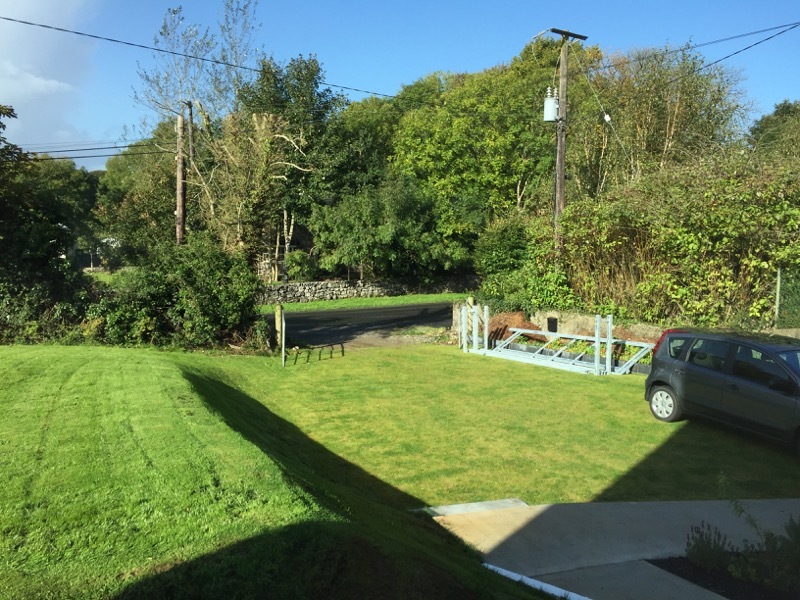 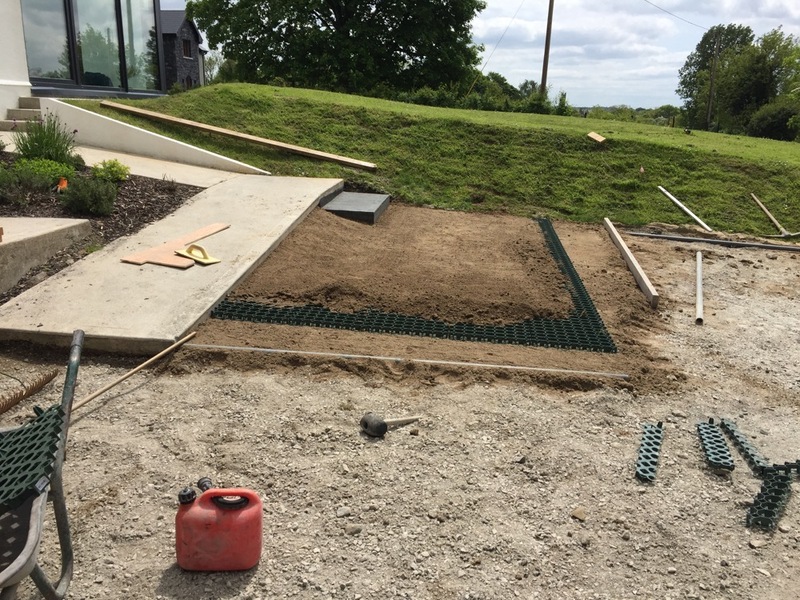 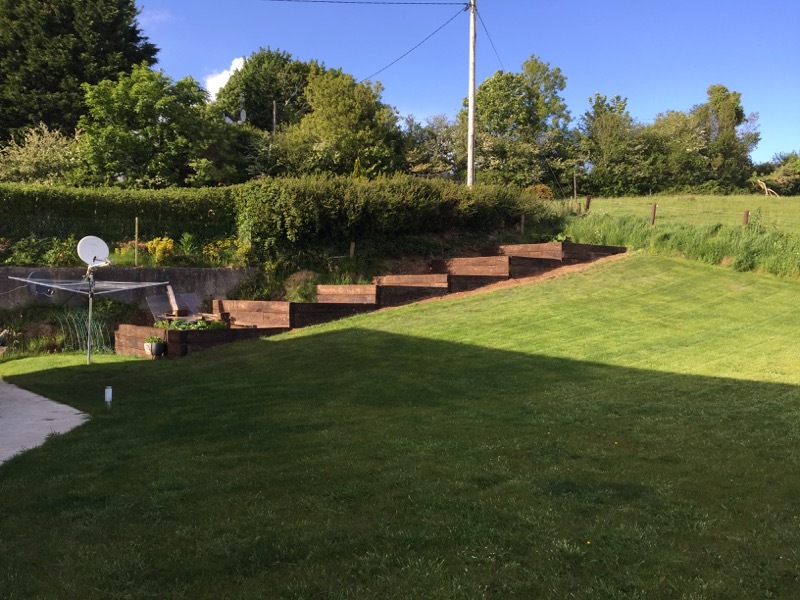 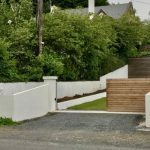 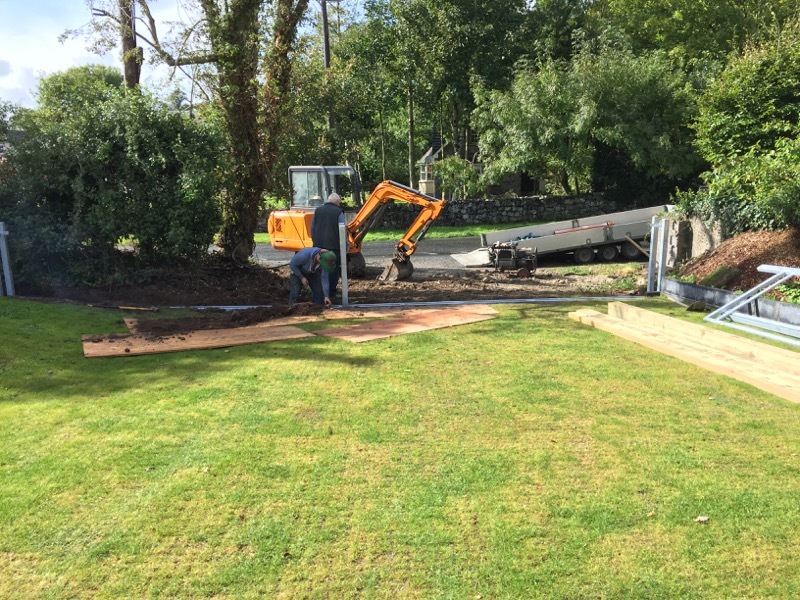 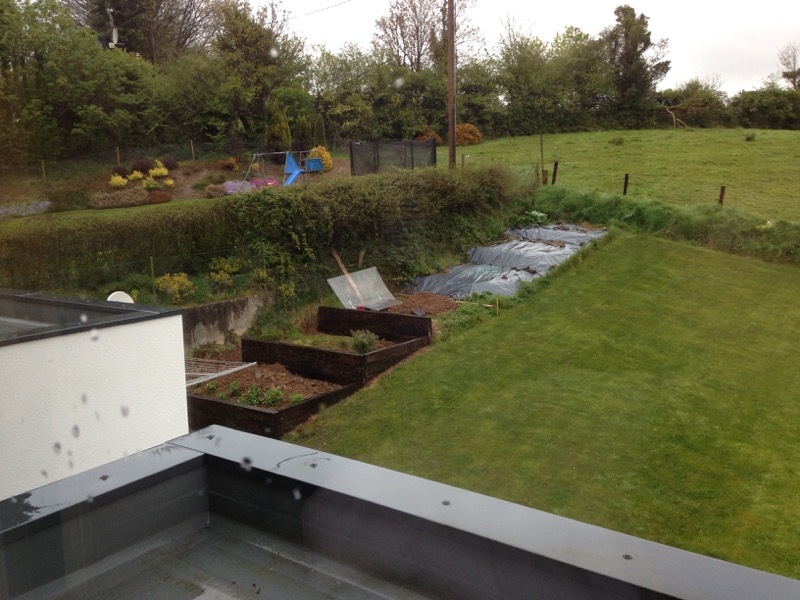 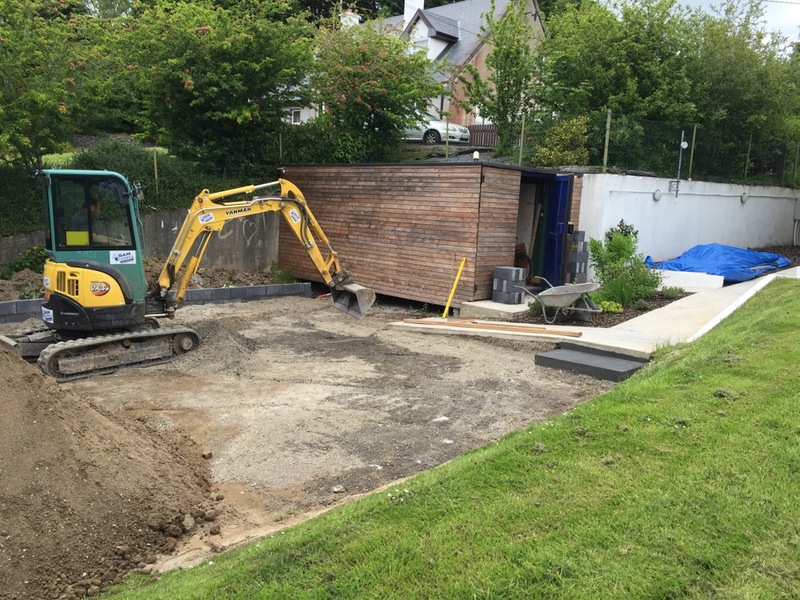 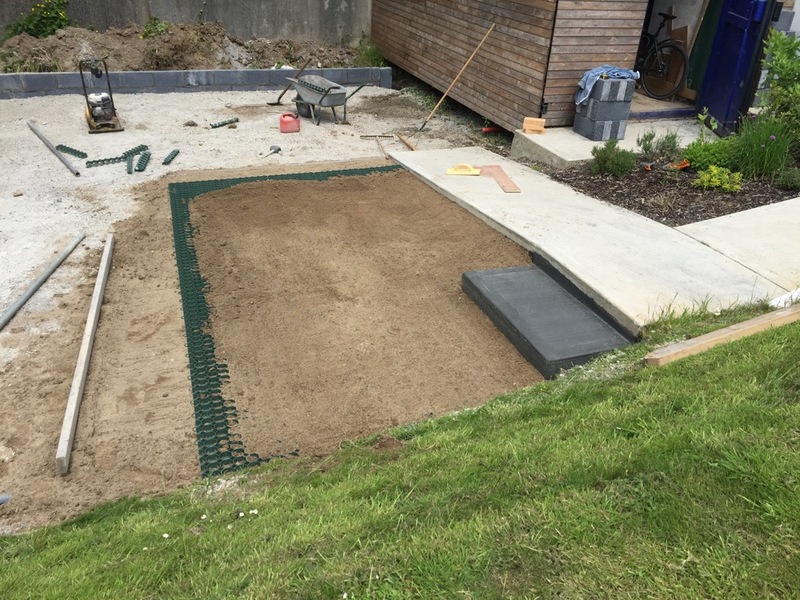 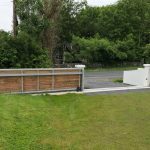 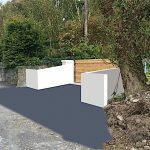 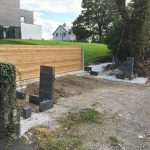 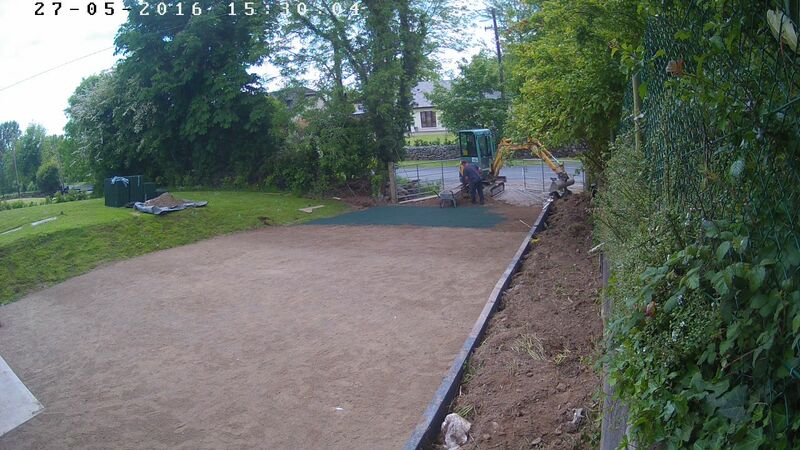 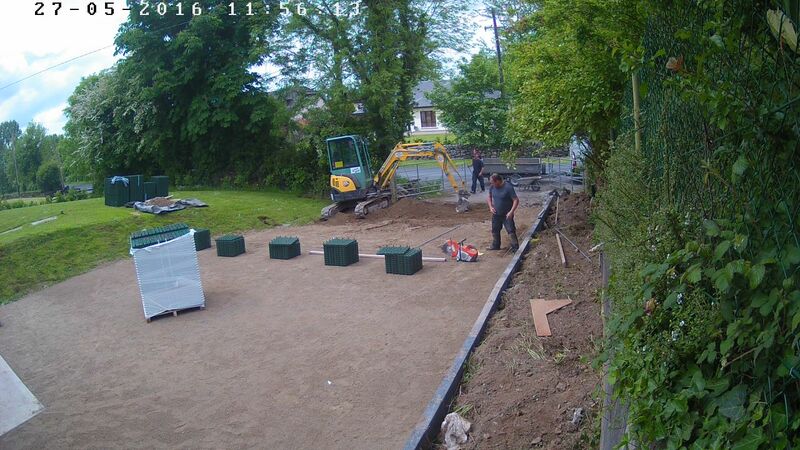 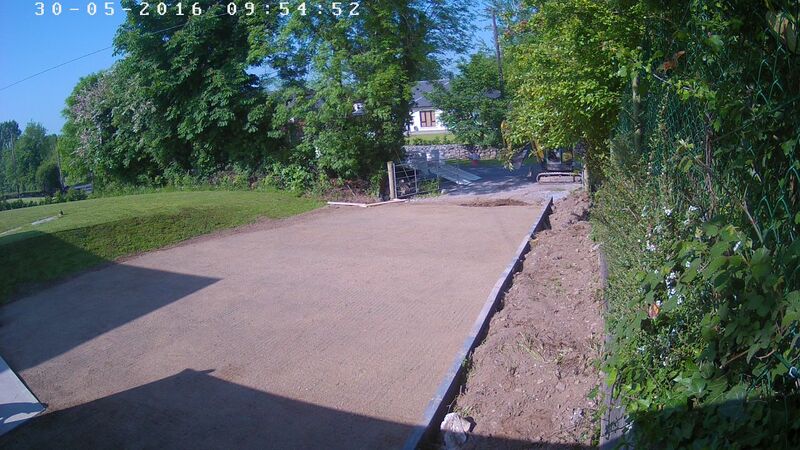 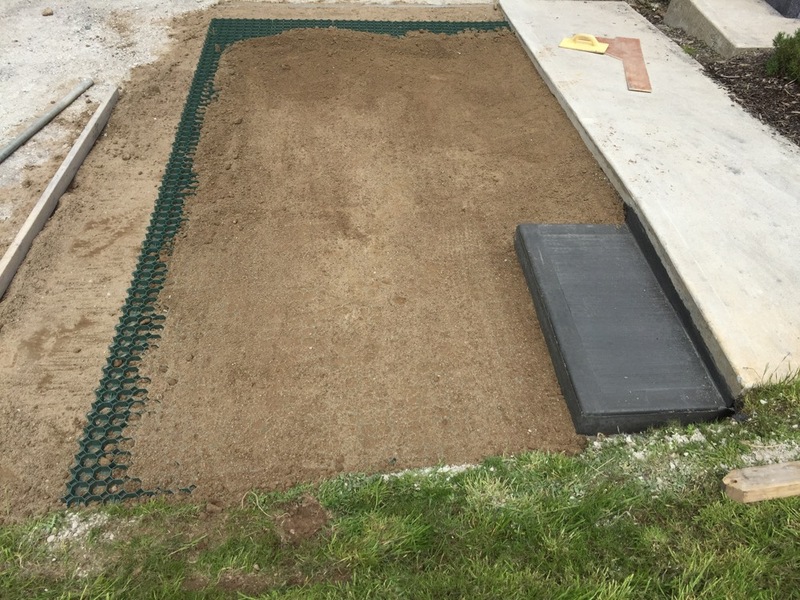 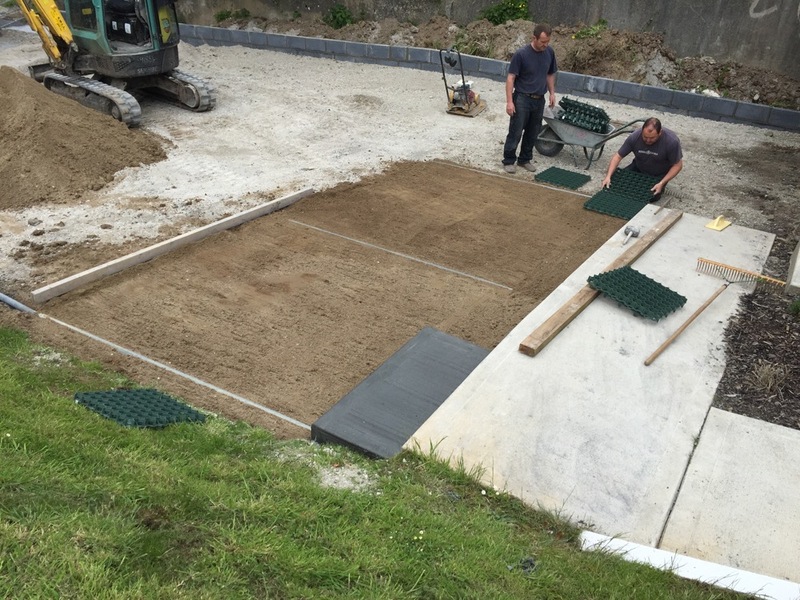 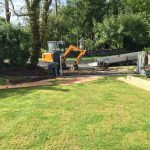 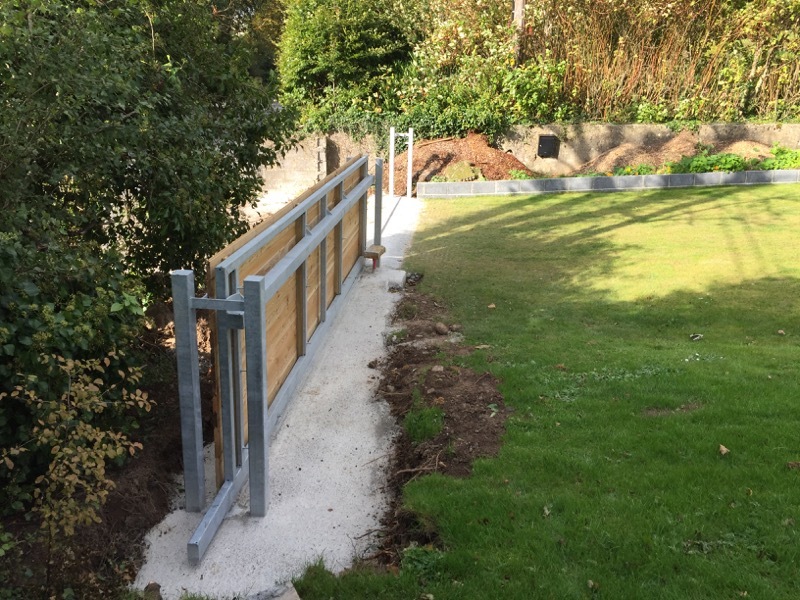 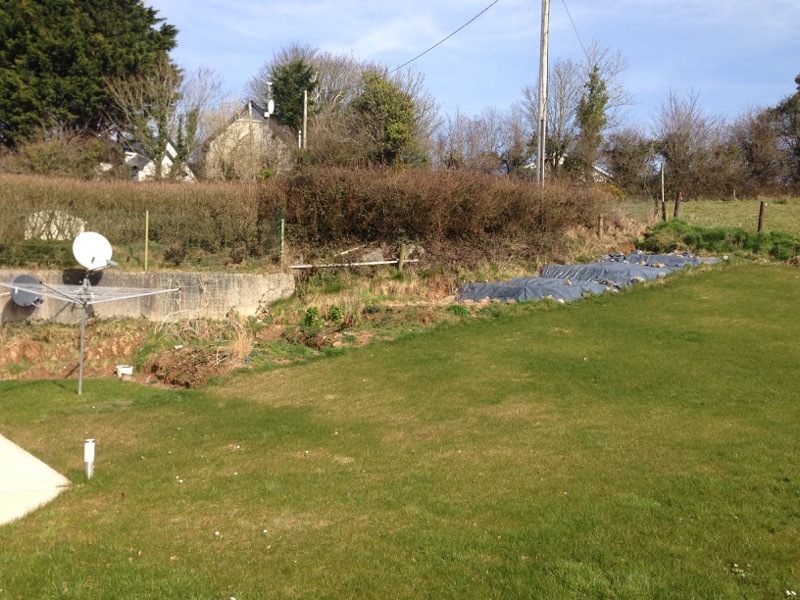 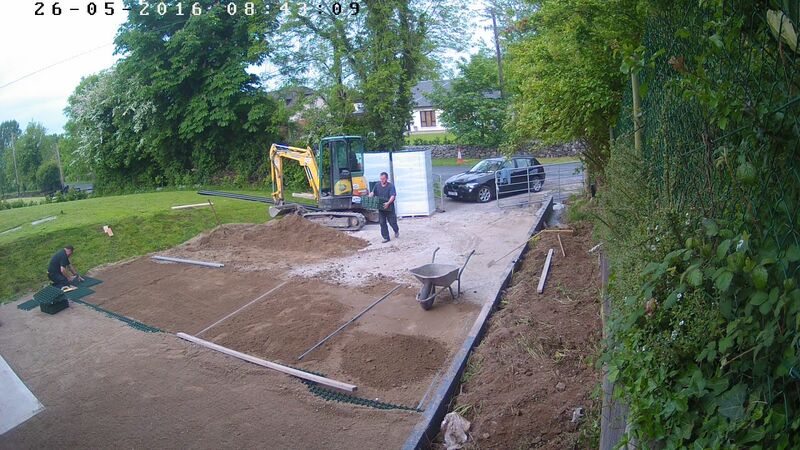 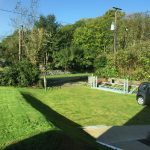 We are using a plastic paving grid system by Geo Coastal (http://www.geo-coastal.ie) which is set on a sand/soil base and filled with a similar mix and then grass seeded. 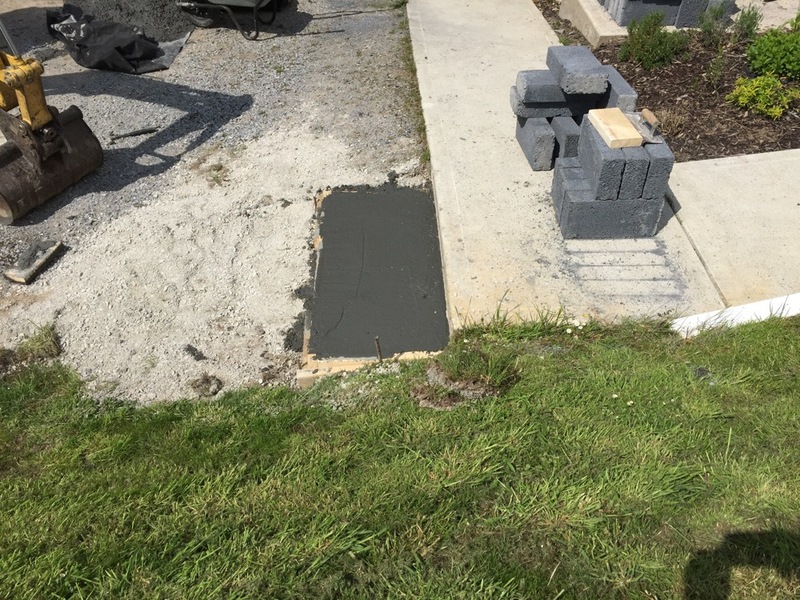 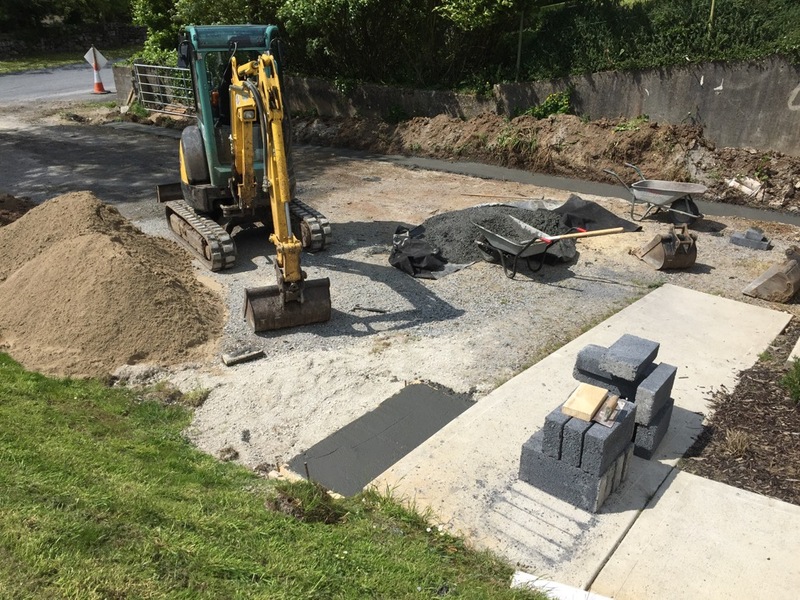 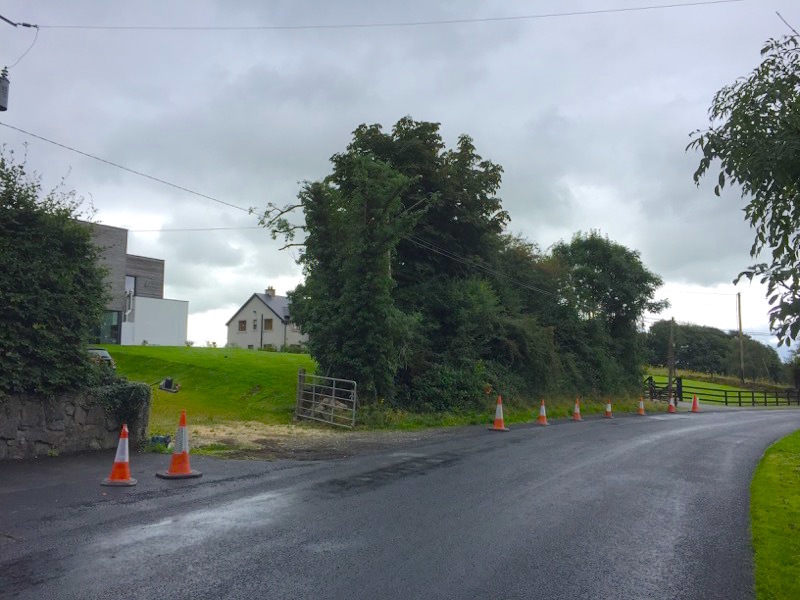 The units were installed by PR Paving Services from nearby Tulla. 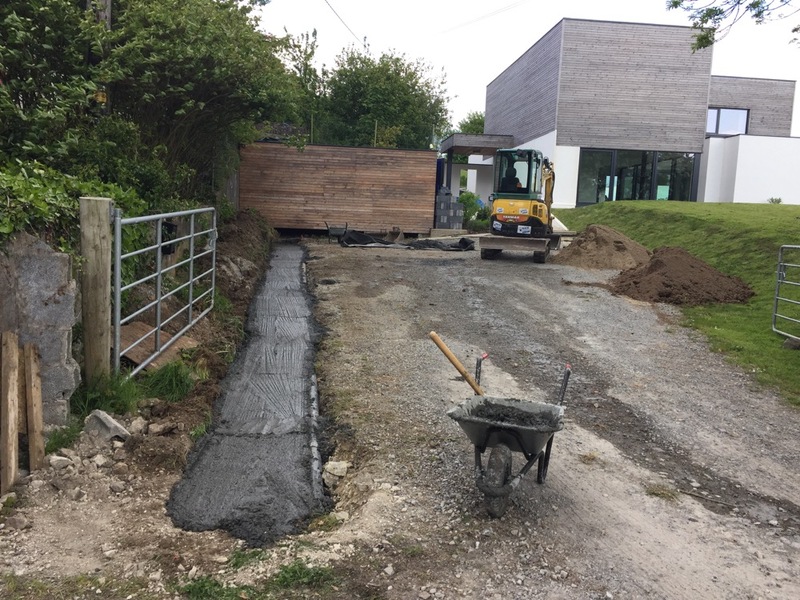 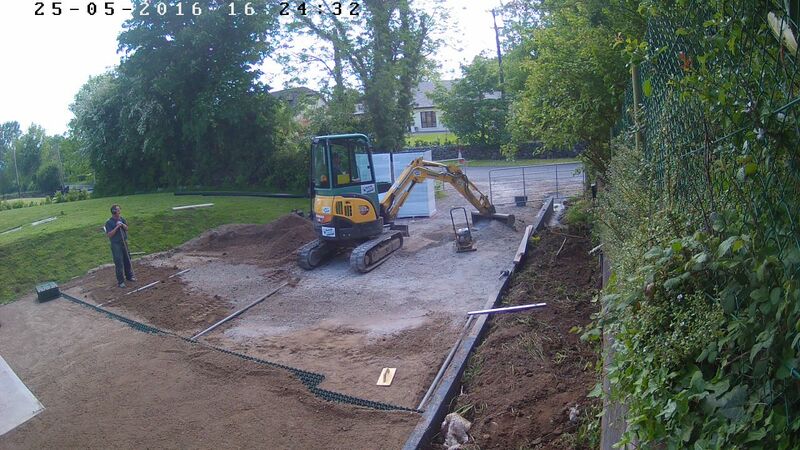 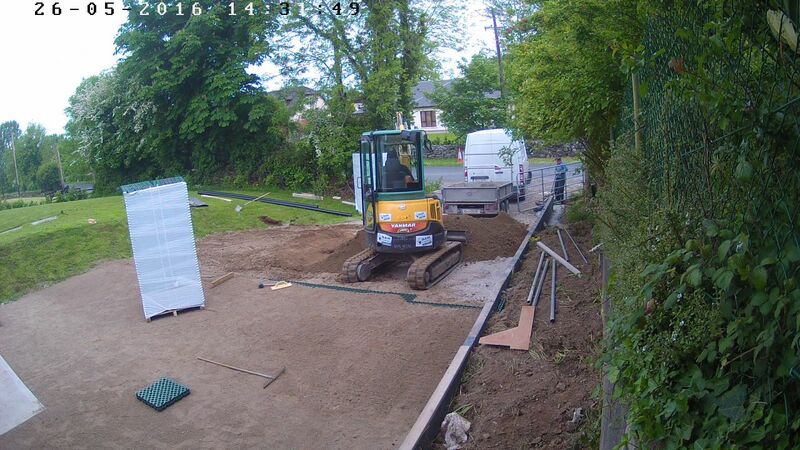 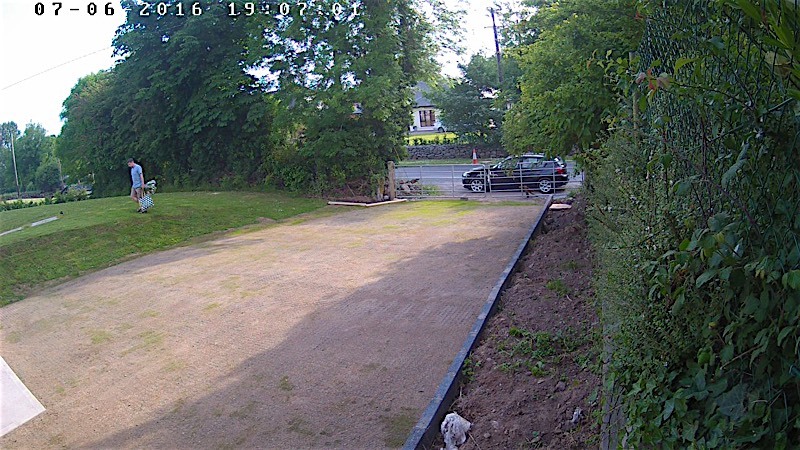 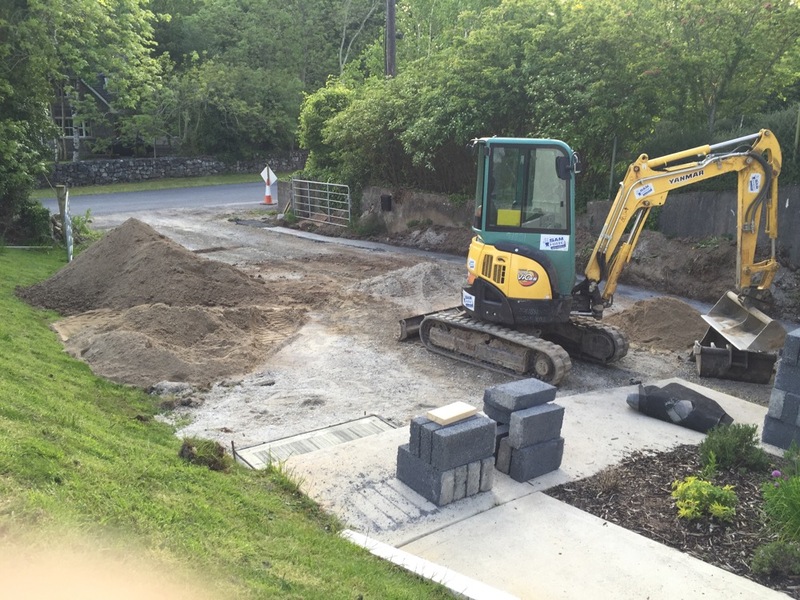 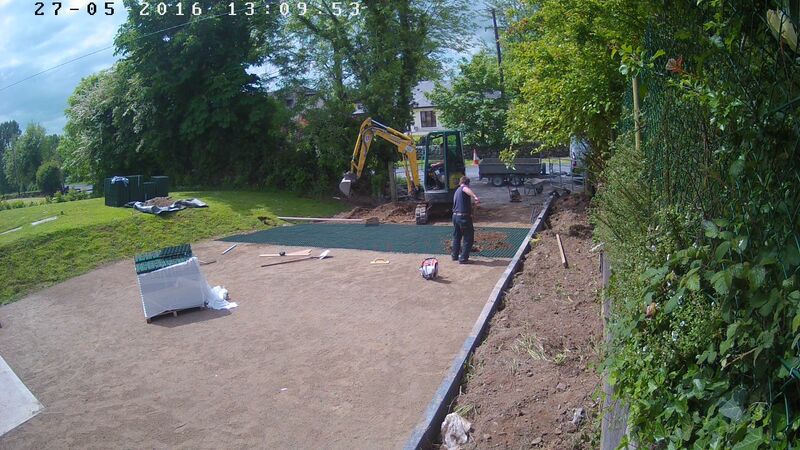 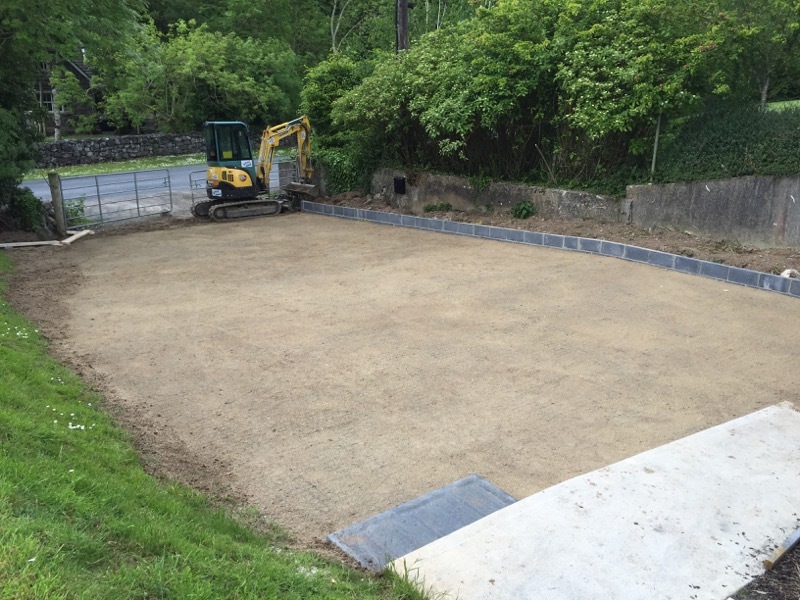 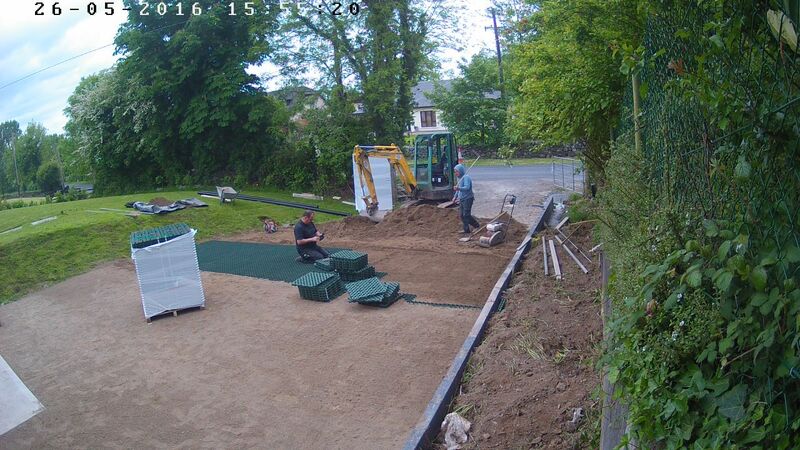 Before the summer is out we’ll have a grassy driveway! 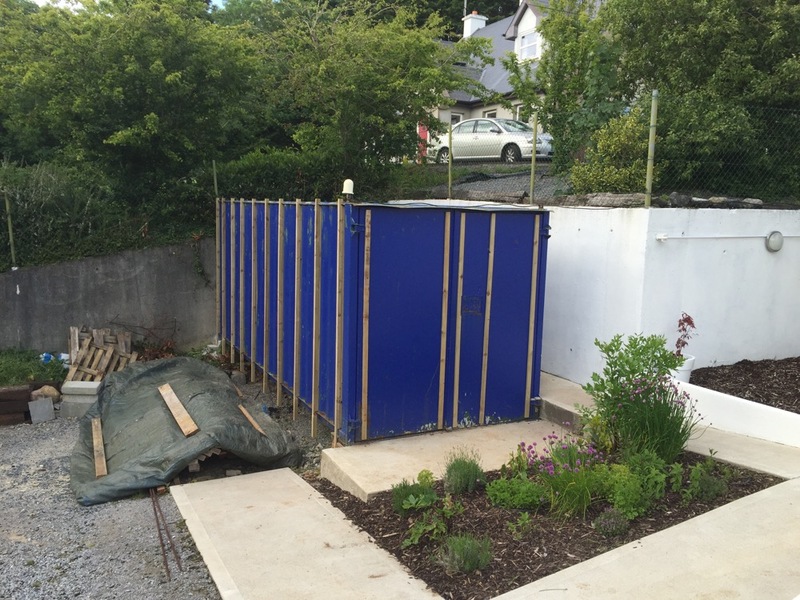 It only took two years but the blue shipping container shed we bought when building the house is finally clad in larch. 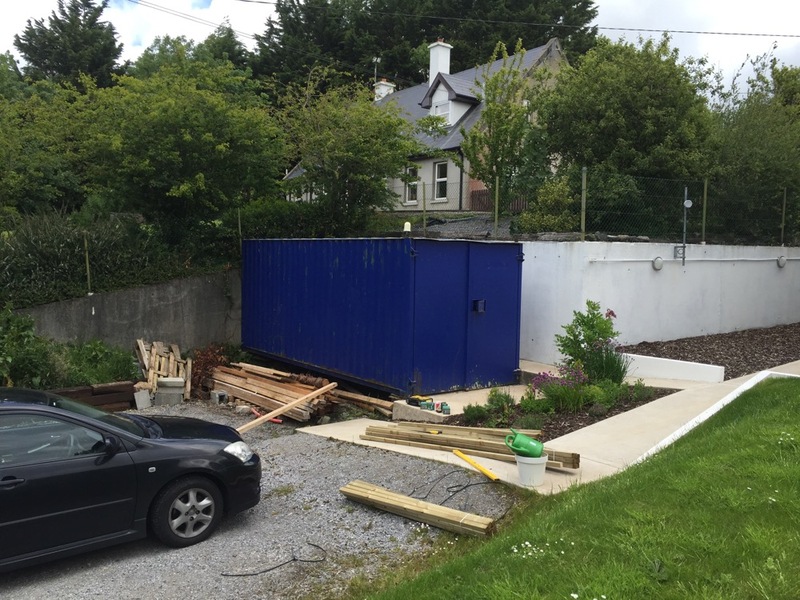 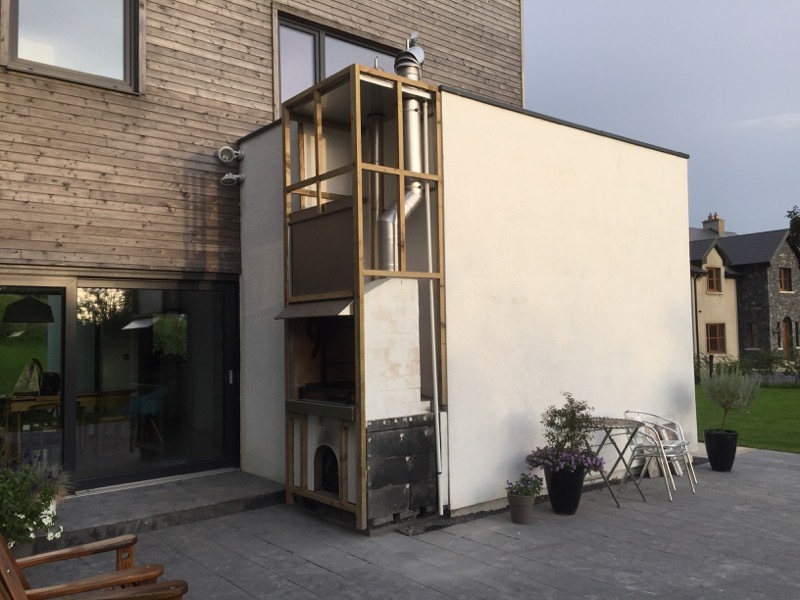 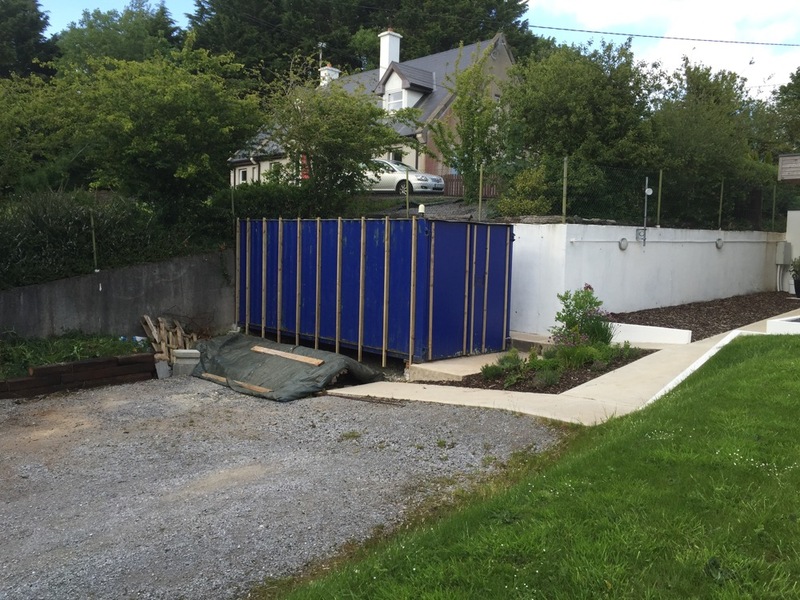 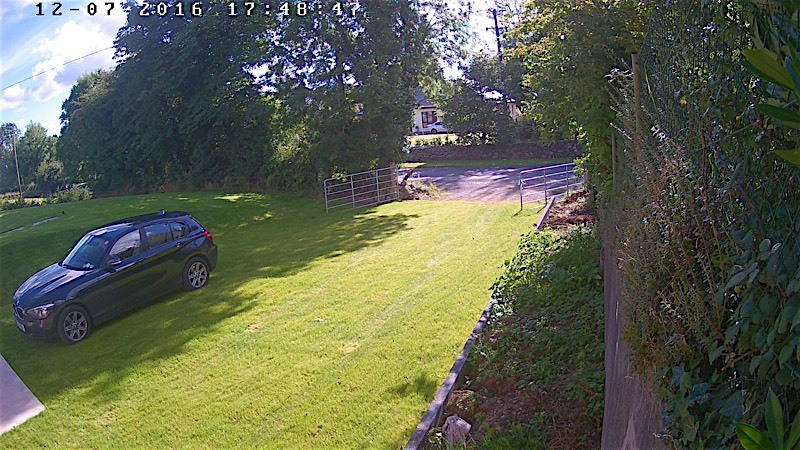 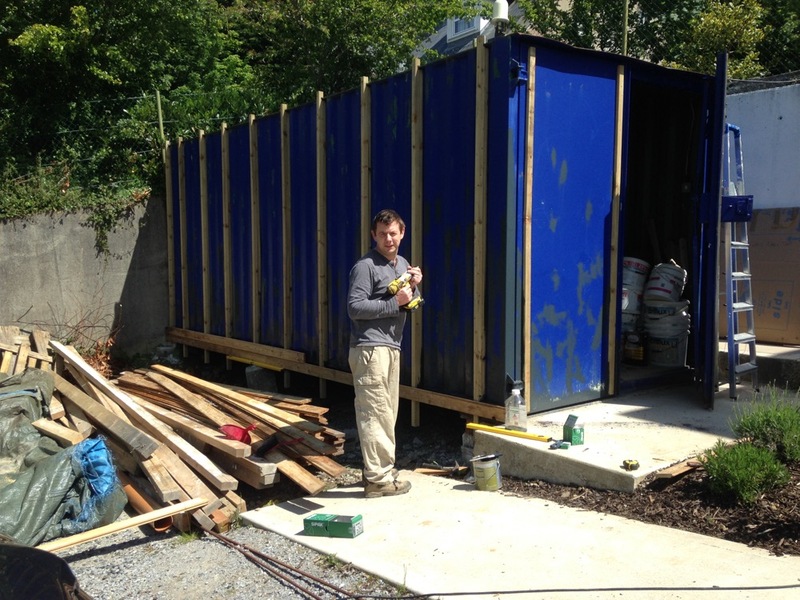 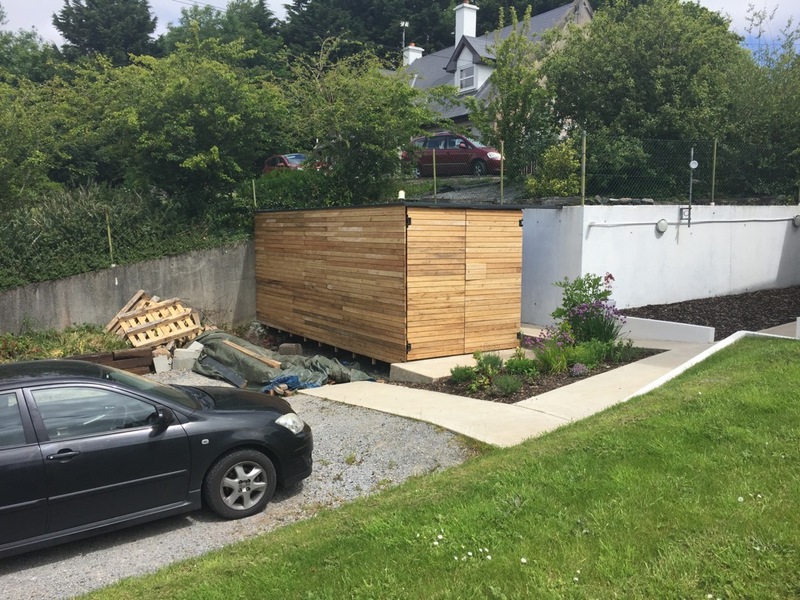 We bough the container from Atlantic Cabins (www.atlanticcabins.ie) to use as secure storage during the building process and decided to keep it as our garden shed. 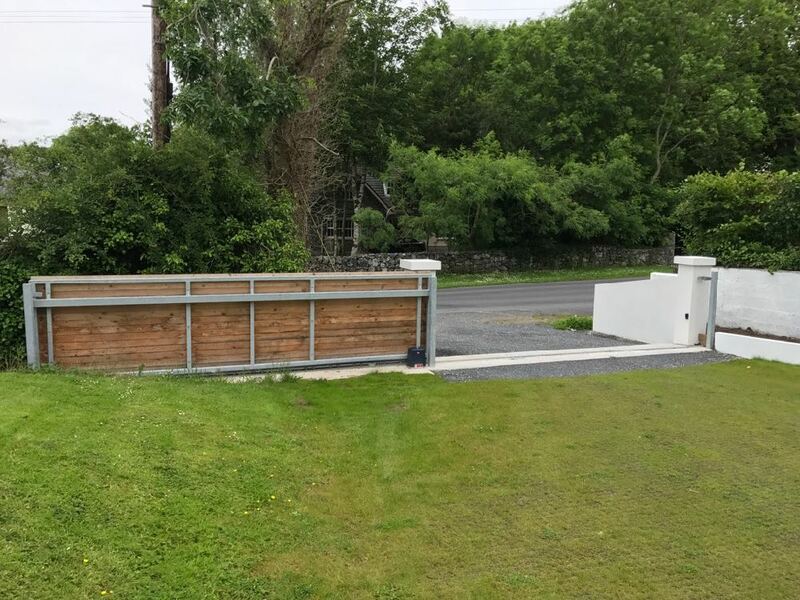 Following a clean and paint touch-up to fix any rusty spots I fixed 2×1 treated timber battens to the side and door using 38mm self-tapping countersunk tek screws for steel. 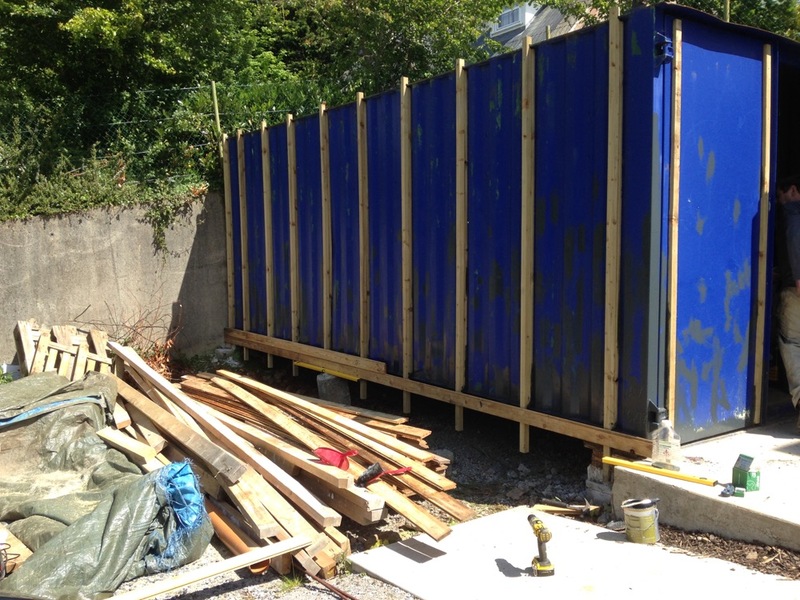 Due to the corrugation on the side of the container I then had to fix 2×2 battens onto the original battens to be able to fix on the horizontal boards. 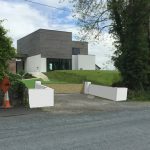 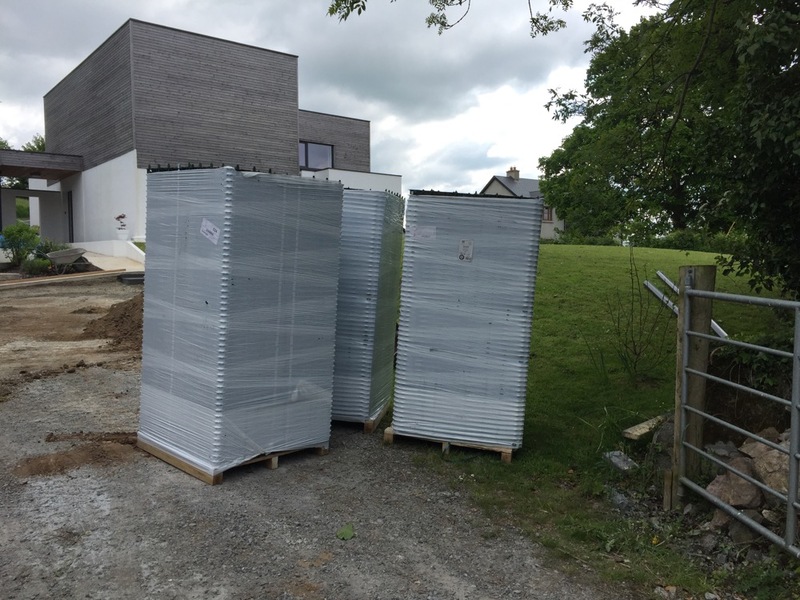 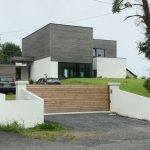 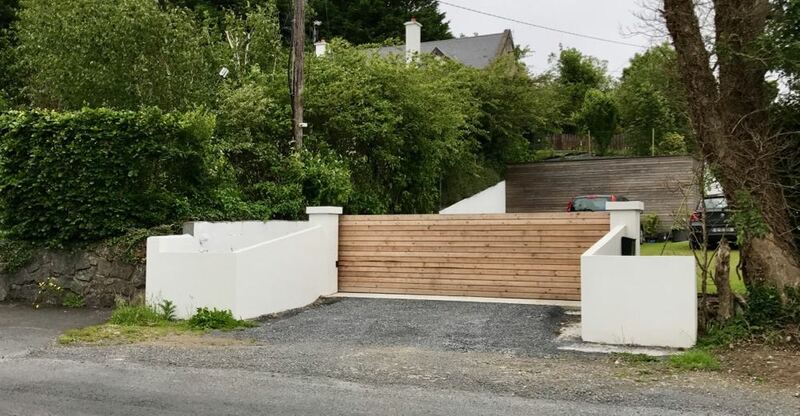 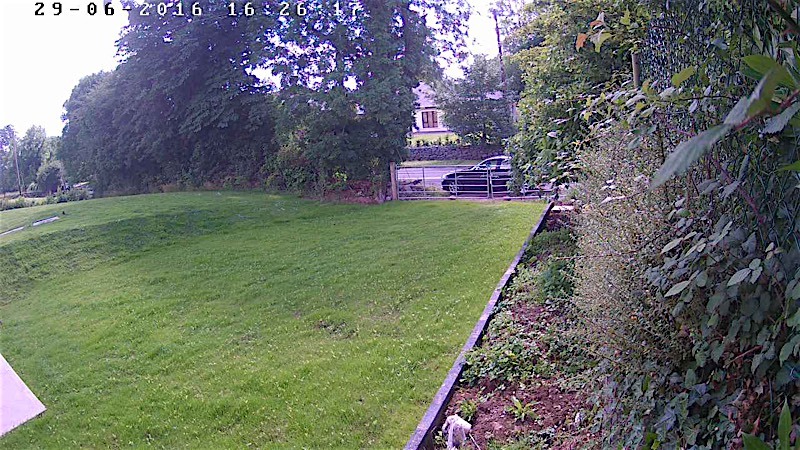 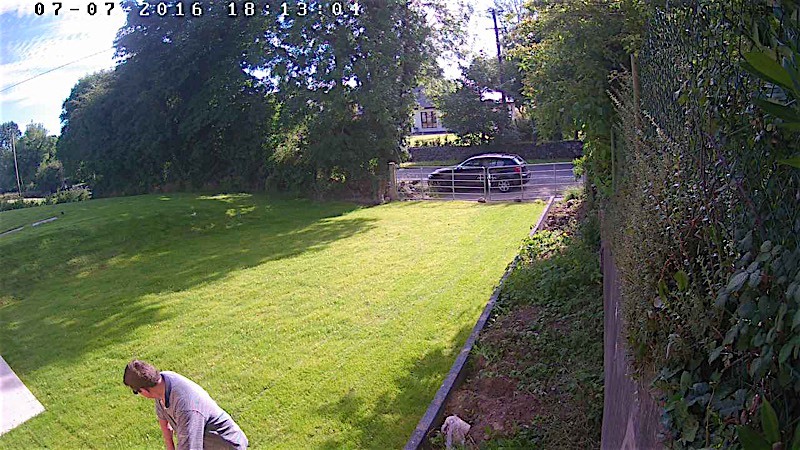 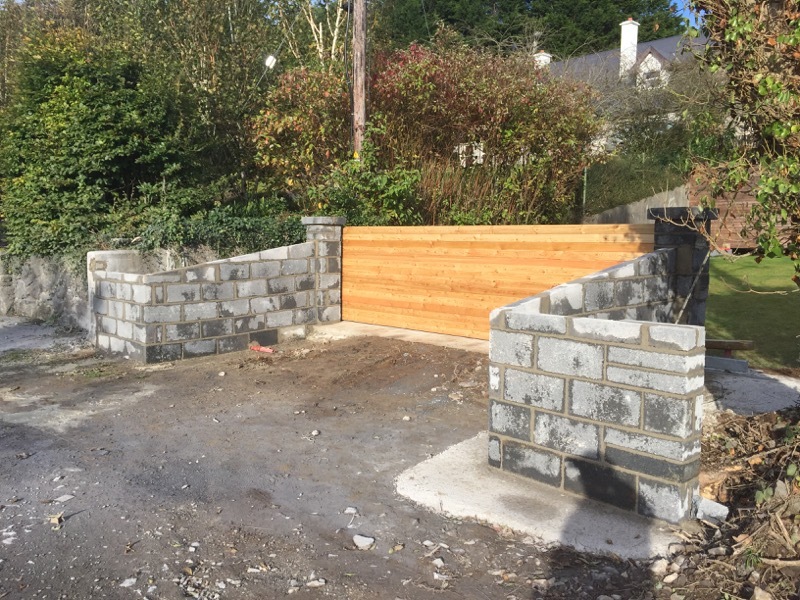 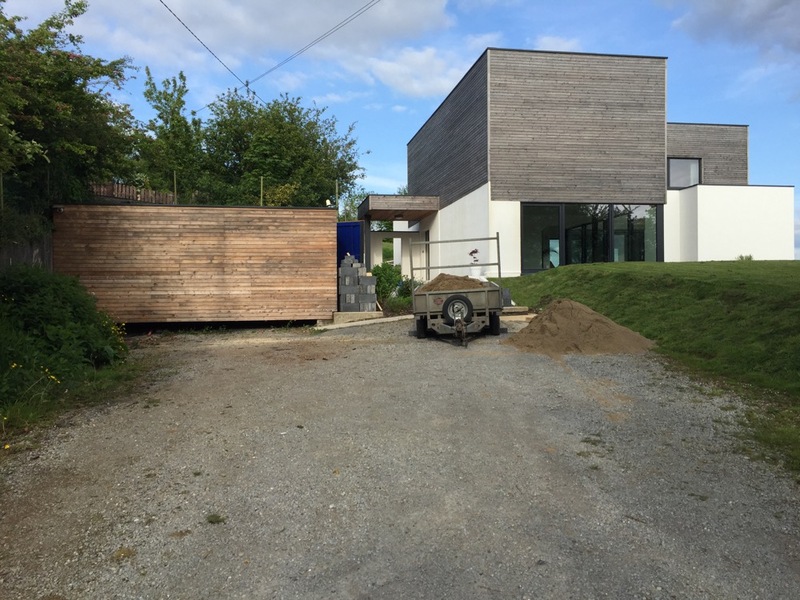 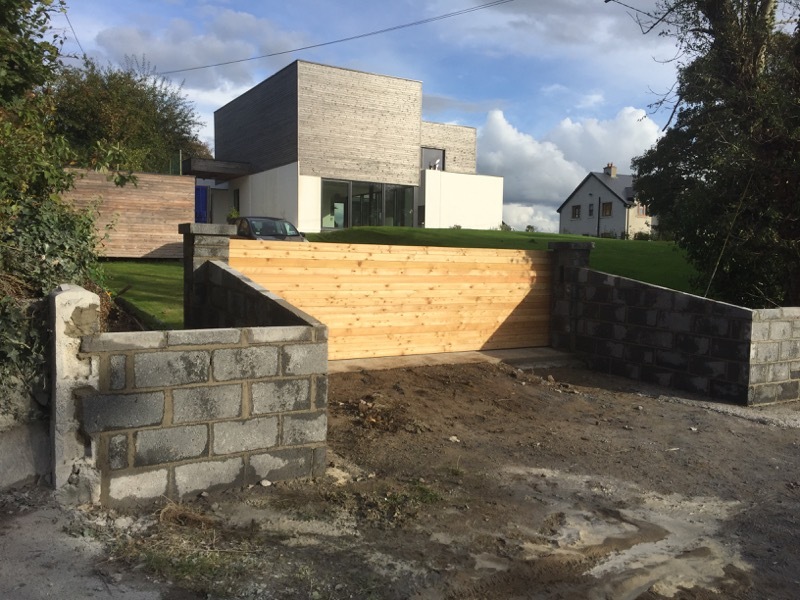 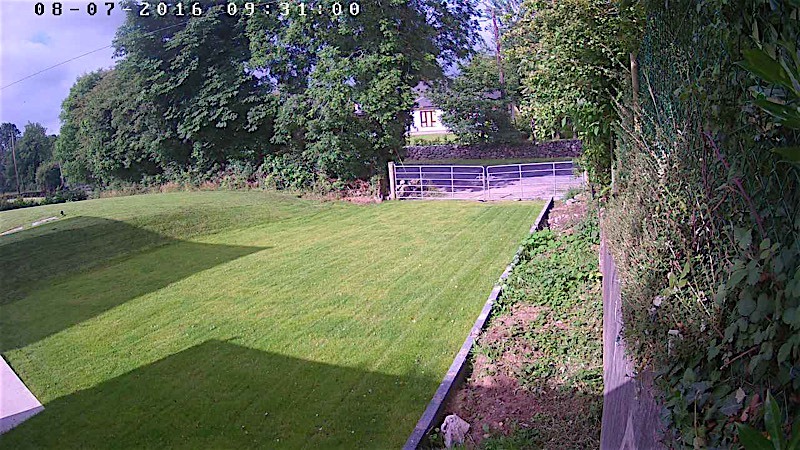 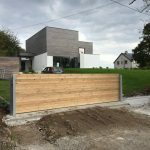 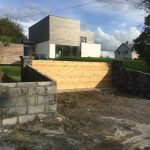 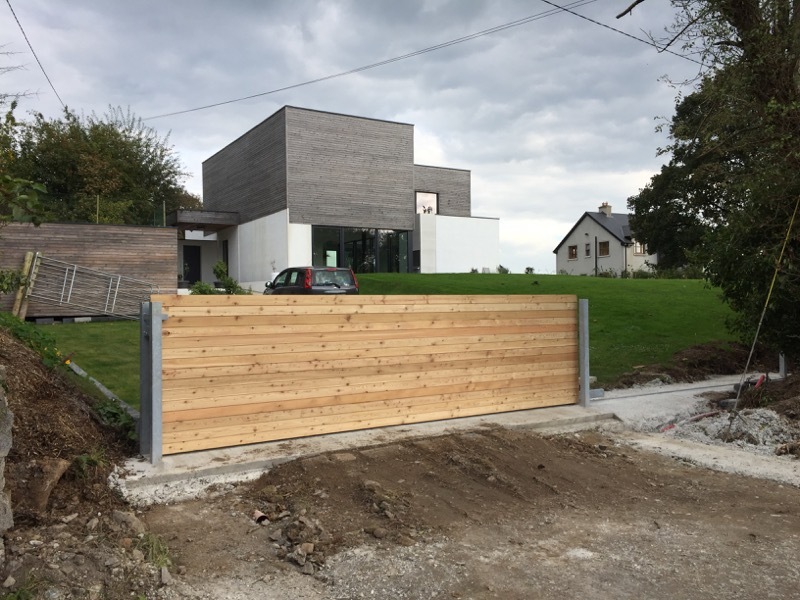 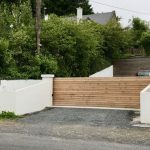 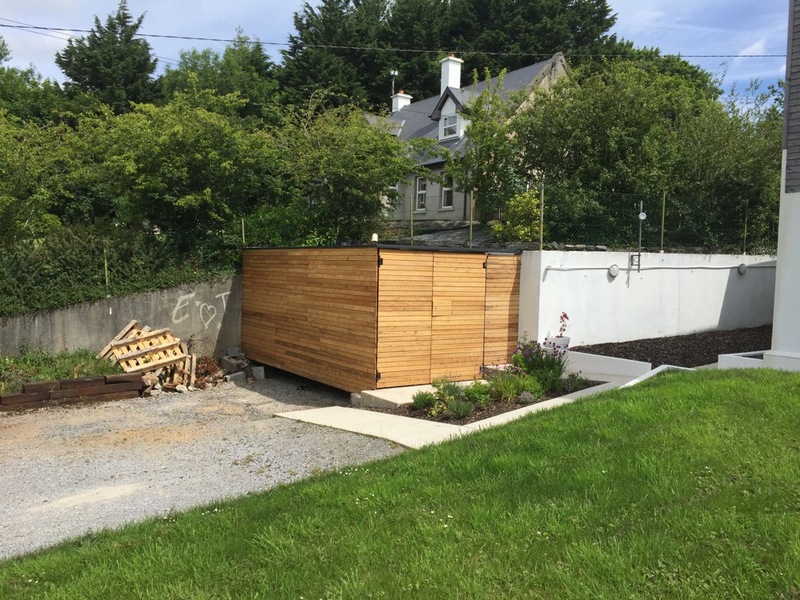 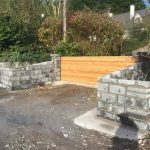 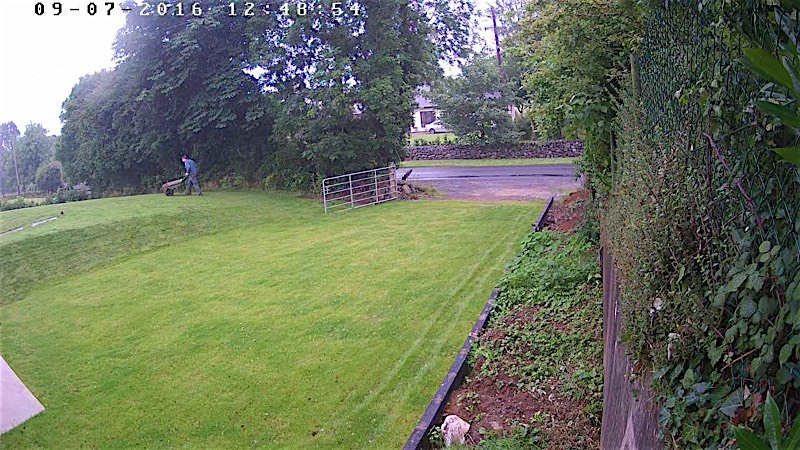 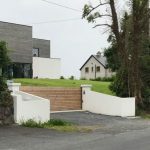 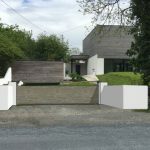 We had bought enough larch cladding from Corell Timber (www.corell.ie) when doing the house to allow for the container however it was a close call as I had only 2 lengths of cladding and a few scrap bits to spare by the time the final board was fixed in place. 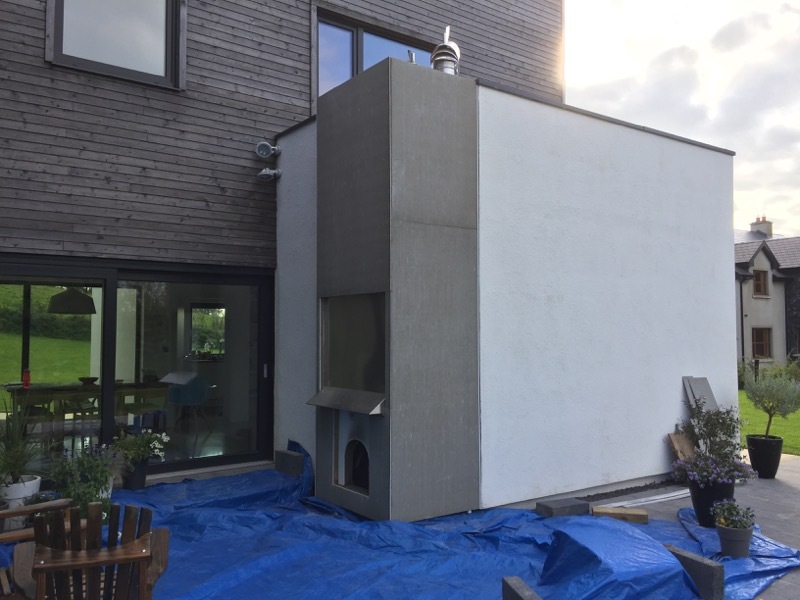 We also had enough left over of the coated aluminium capping which is on the house which finished the top edges of the cladding. 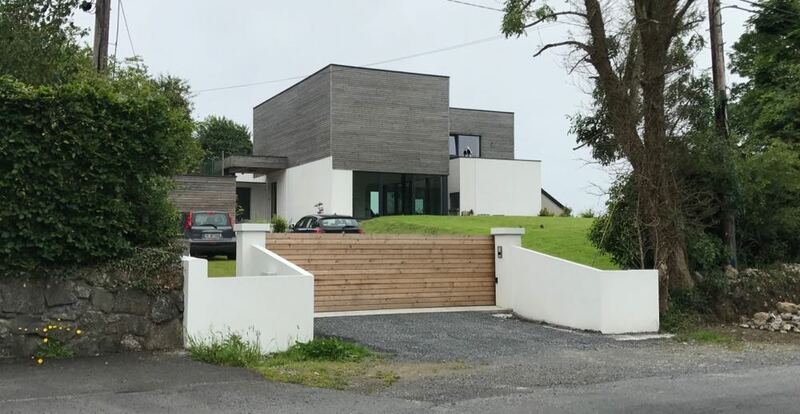 Now we sit back and wait for it to silver and fade to match the rest of the house. 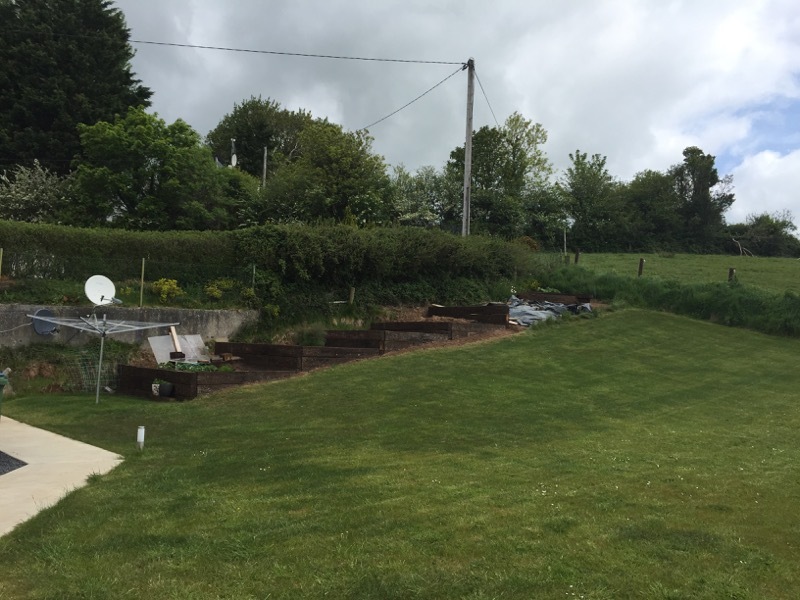 It has been a slow job but we finally got all the vegetable beds setup at Jackdaw Ridge. 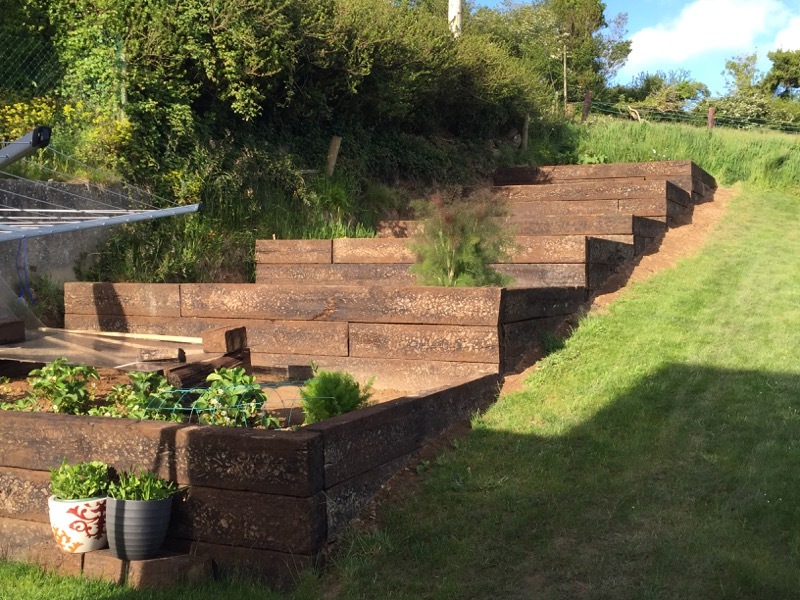 Using recycled railway sleepers – these solid pine sleepers have great character and are well weathered. 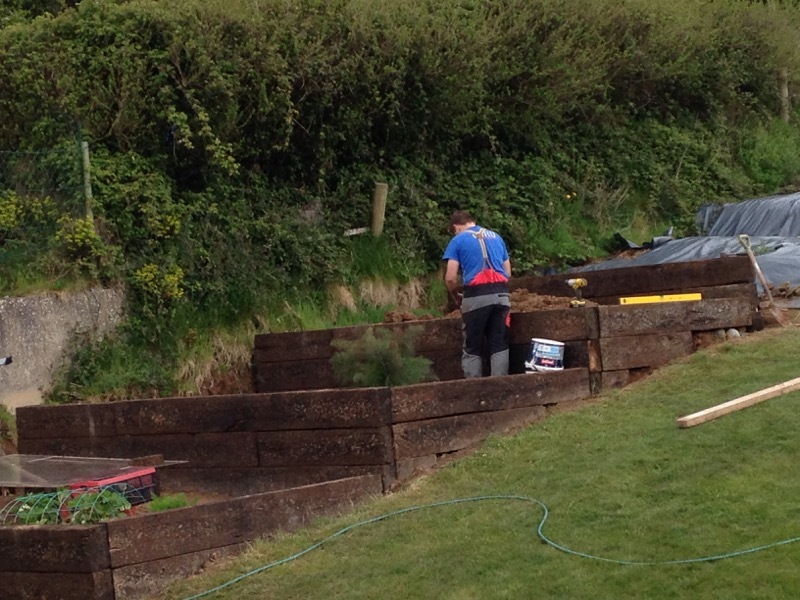 We’d looked for oak sleepers but they were elusive and after waiting for weeks we finally opted for the pine. 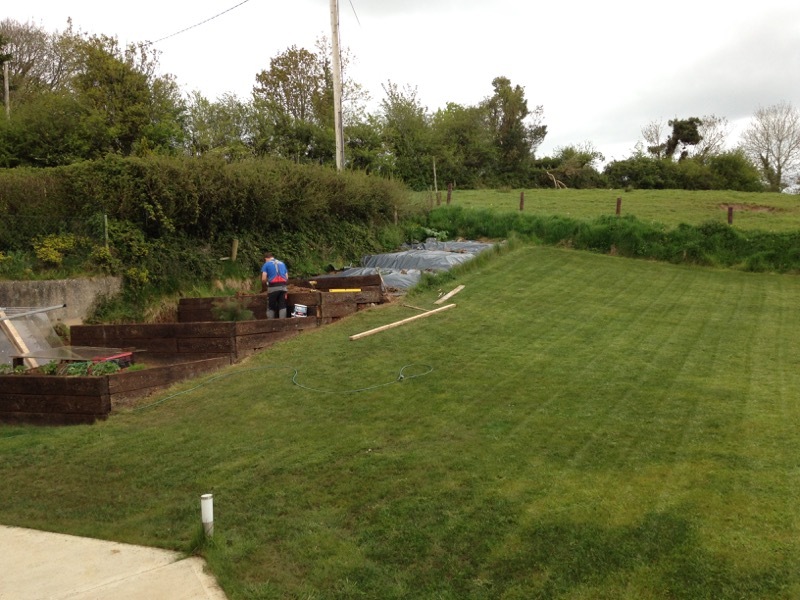 The sleepers were sourced from Europe and delivered by Roskam Farm Enterprises near Tuamgraney. 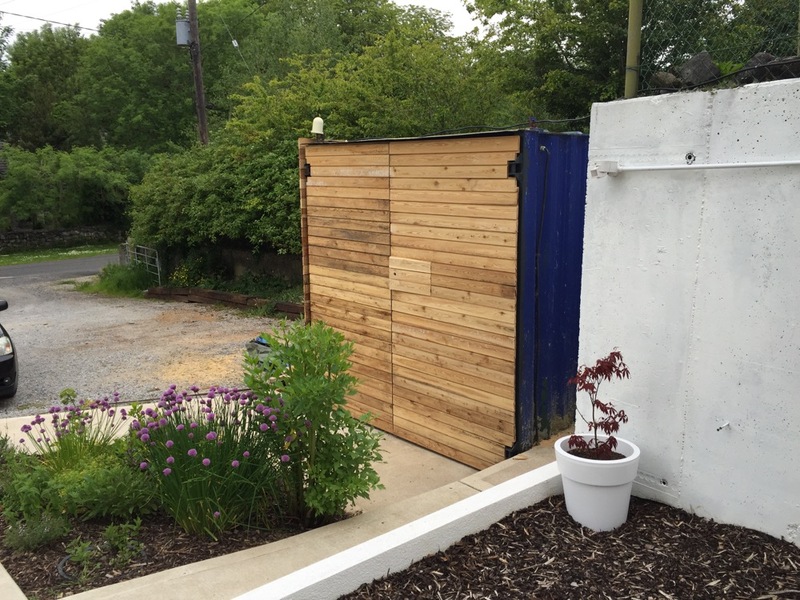 Jan Roskam was very good to deal with and I’d recommend him. 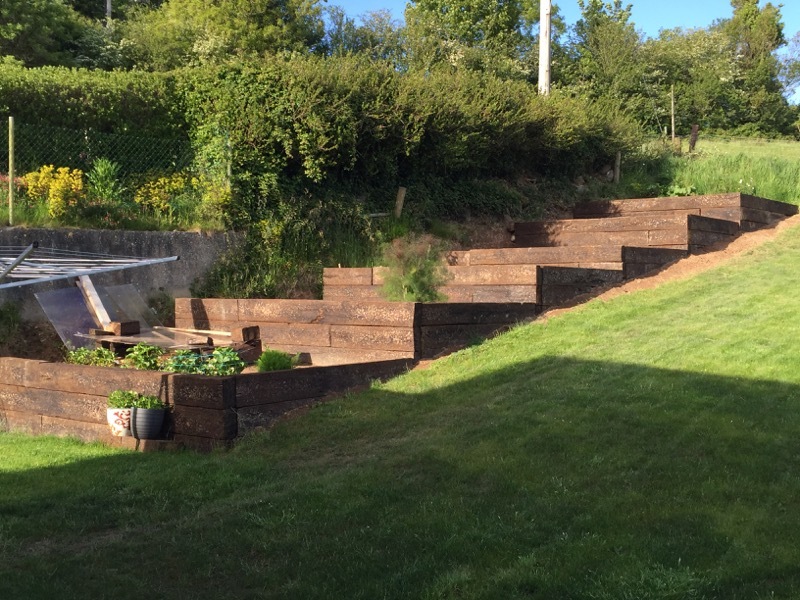 They are fairly hefty 2.6m x 0.25m x 0.15m and took a fair bit of manhandling to cut, set and fix them in place. 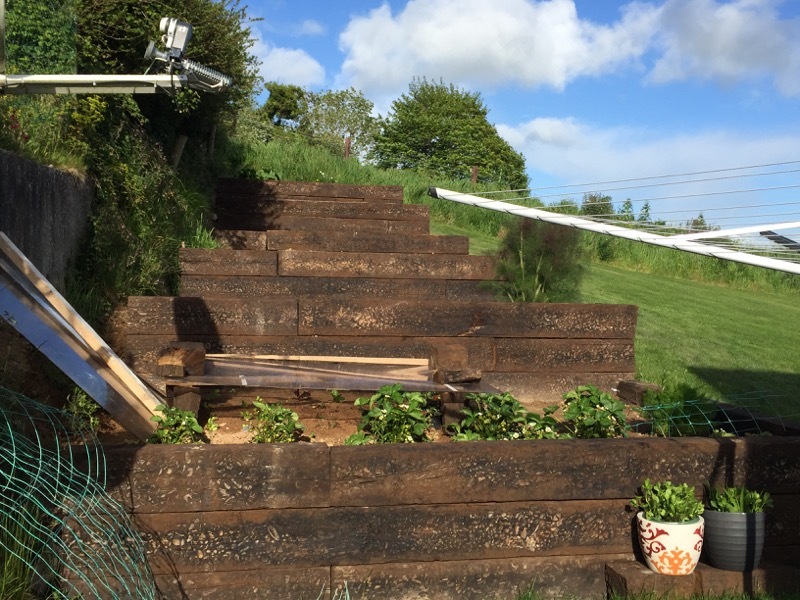 We’ve got spuds, tomatoes, strawberries, courgette, squash, salad leaves and rhubarb underway and a few more beds to plant over the summer .. looking forward to a few fresh veggies in the months to come. Our herb bed was getting almost nightly disturbances .. thought it was a local cat leaving us nasty messages but it looks like the culprit is a harmless, slug-eating, friendly hedgehog.